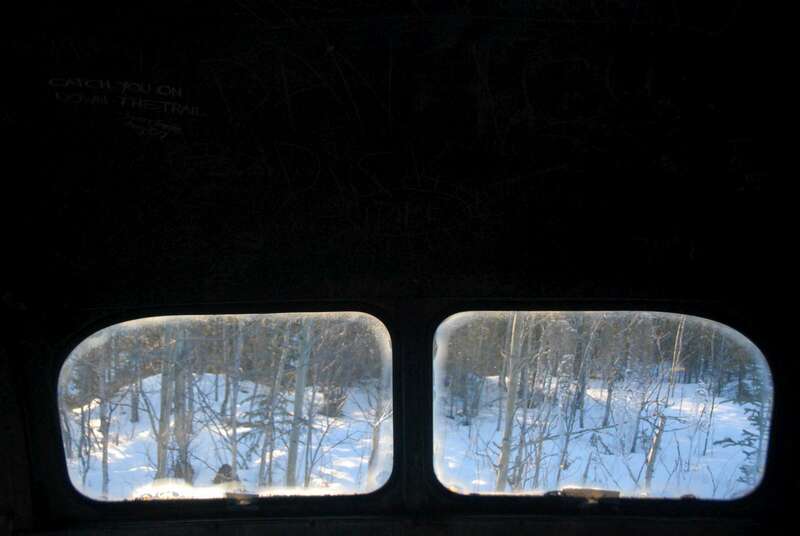 We made the hike to visit Into the Wild’s magic bus on Stampede trail outside of Healy, Alaska this weekend. 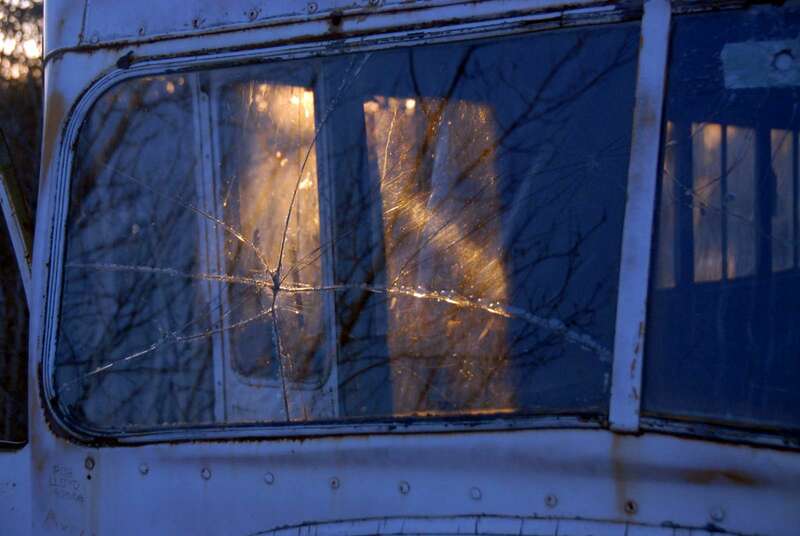 The jury is out and the famed bus from the popular book by John Krakauer and movie by Sean Penn (Into the Wild) is still the subject of considerable controversy. 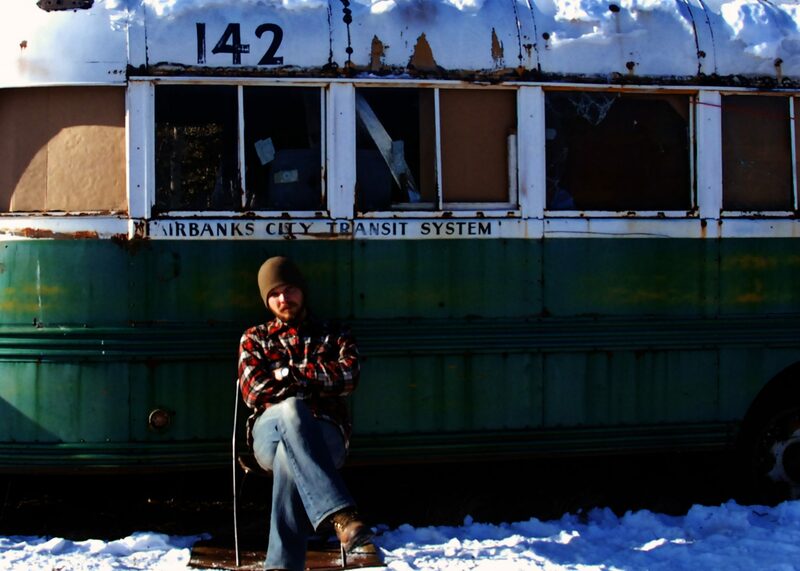 Christopher McCandless himself has become a hero to many and a sore spot to some. I fall somewhere in the middle and I’ll go into my own motivations for visiting Into the Wild’s Magic Bus a little later. 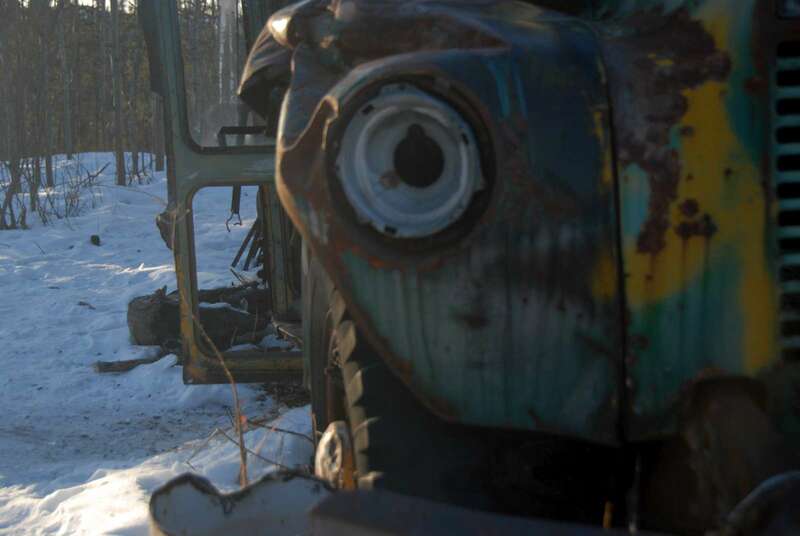 For now, let me first start be dispelling the rumors floating around Fairbanks and the Internet that the bus has been cut up and either disposed of or moved to a different location. This is simply hype. The bus is still there and intact, mostly. 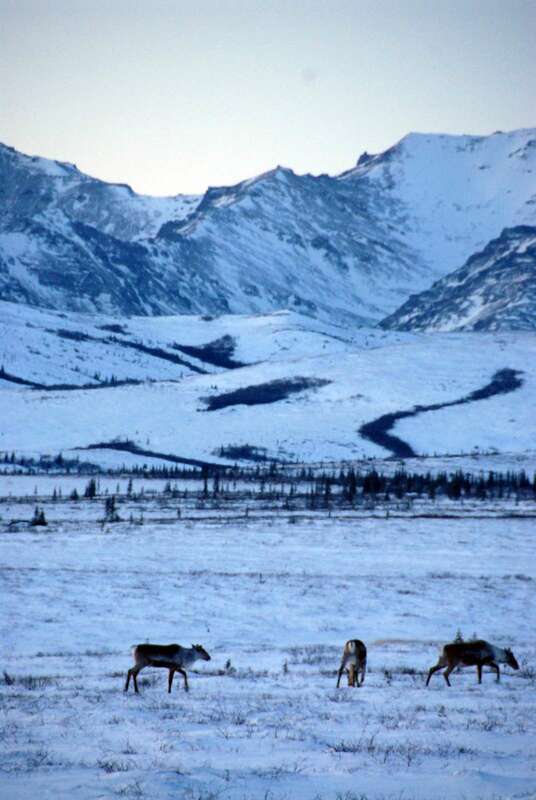 The rumors, however, do contain some insight into the thoughts and feelings of Alaskans. For as widespread as these rumors are they must have gained headway under the propagation of more than one person. The intent is perfectly clear, to keep people from coming all the way up to Alaska to visit that bus. I personally think there are two possible motivations behind these rumors. The first is the exact fate that met Chris McCandless. 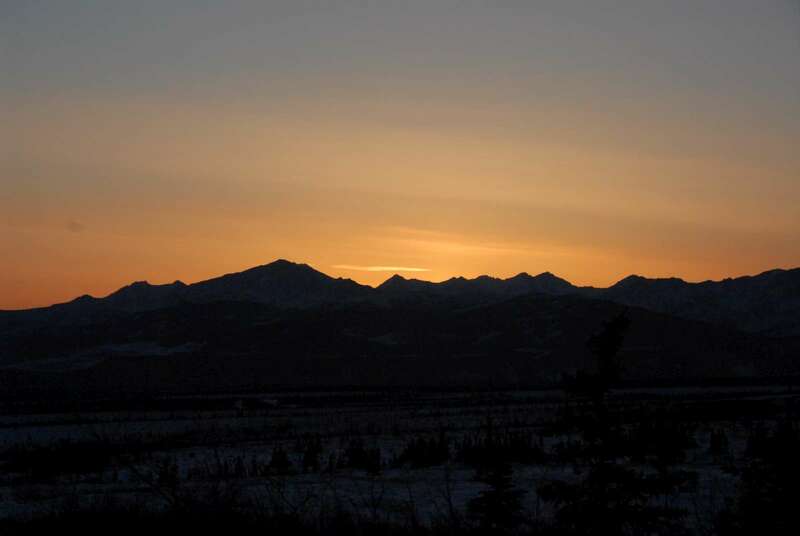 Just last summer the Anchorage paper reported two hikers missing along stampede trail. The kids were found wet, cold, in street clothes with almost no food and plastic bags wrapped around their sneakers. 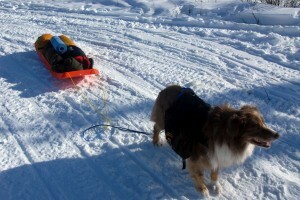 The ill prepared adventurous duo was flown to safety by means of rescue helicopter. If I’ve learned one thing up here it is that Alaskans do not take the wild lightly and are put off when others do. McCandless himself was better prepared than half the kids wandering out there these days and we all know the fate that befell him. I think Alaskans in general find it annoying that people want to mimic Chris’ voyage with poorer preparation expecting a different outcome. 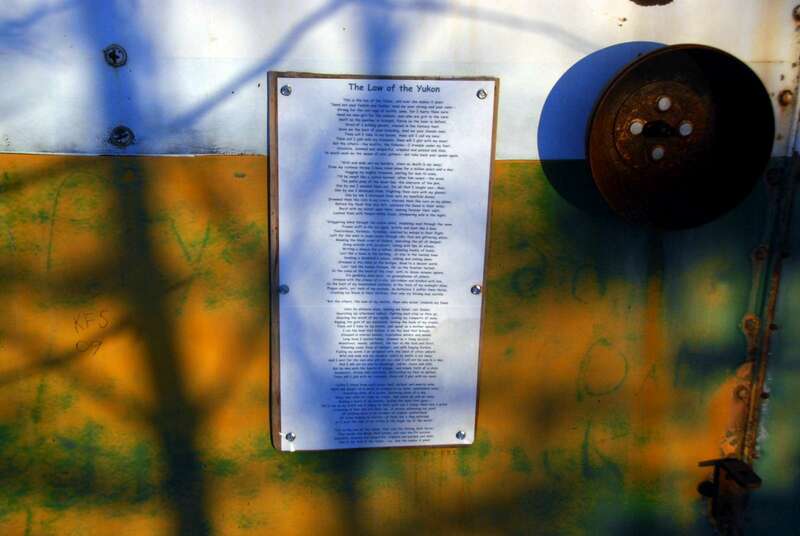 Secondly, the tragedy of the story itself has become a part of Alaska’s and Healy’s heritage and it deserves to be preserved. 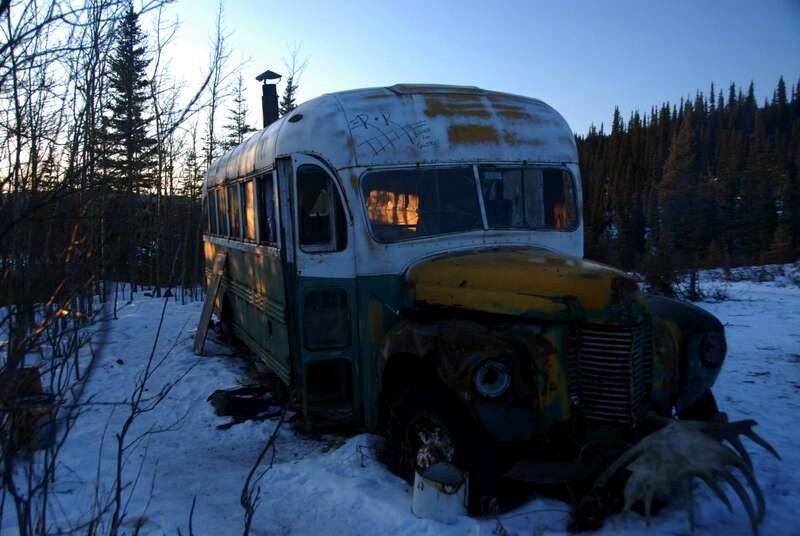 I spoke with a bartender at the Totem lounge in Healy a few miles from Stampede road who had visited the magic bus often including a visit subsequent to that of Sean Penn. 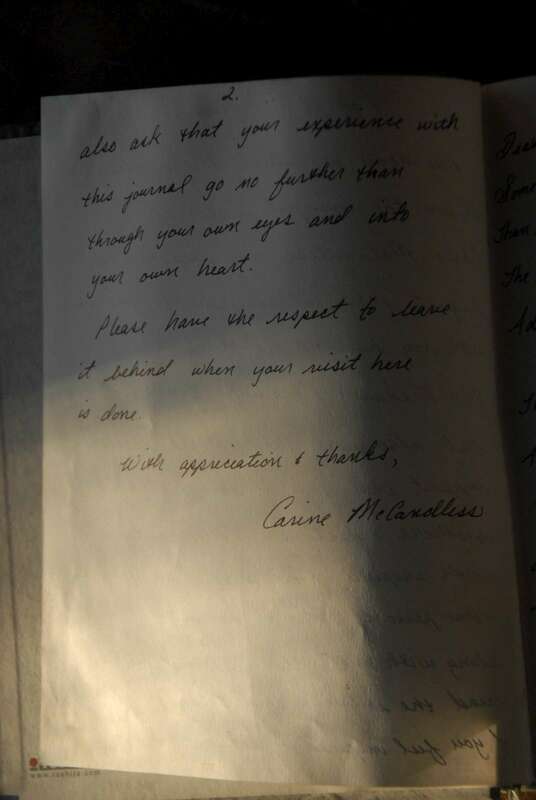 He found a letter from Penn left in that bus that very politely asked people to preserve the bus as a memorial to Chris McCandless and not to remove any of the items contained within. 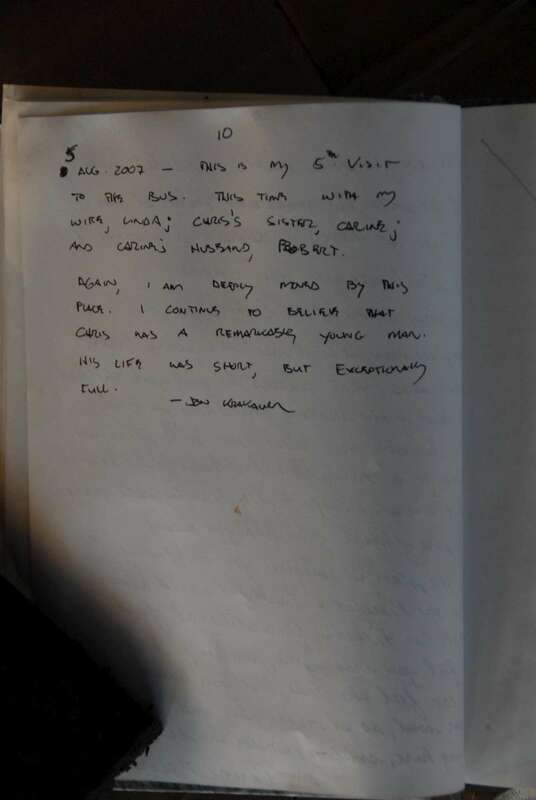 He visited the bus again a few months later and the letter from Penn itself was gone. 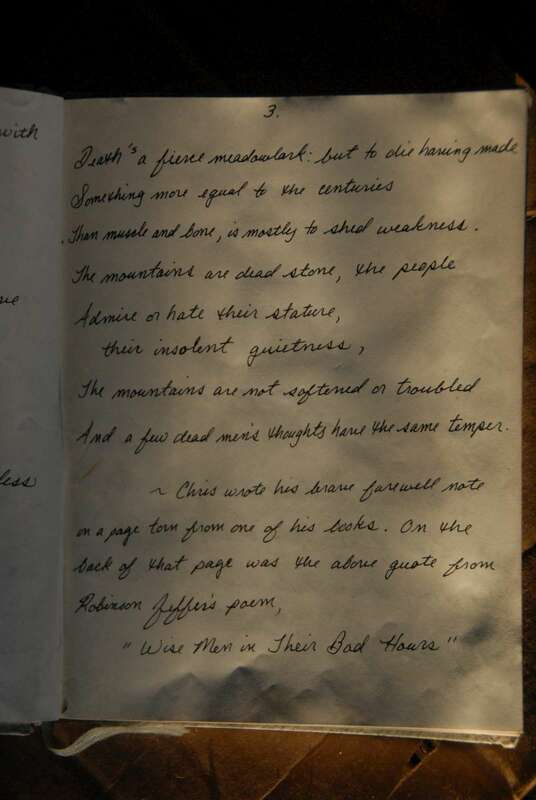 For those who revere Chris’ story it seems hypocritical to want to keep a physical piece of it. I’ll ask you myself before laying out the details of getting to the Magic Bus that if you do go, leave it in the same condition you found it. And that goes for the beautiful country that surrounds it as well. I intend to provide all of the information that you need to find Into the Wild’s Magic bus but not before my own reflections on the territory and terrain. The trail is well maintained and the hike itself is not exceedingly difficult, but it is 26 miles one way. That’s more than 50 miles round trip. I think the first thing that it would behoove yourself to ask is: Have I ever walked 50 miles in mountain terrain with a minimum of five days worth of gear and provisions? For most of you the answer is probably no. By the way, it takes more sustenance to maintain the body when it’s walking 10 or 15 miles a day with gear than it does when you’re sitting in front of your computer. The next thing I want to point out is that we made the trek and arrived at the bus on the first day of spring, which is March 20th. 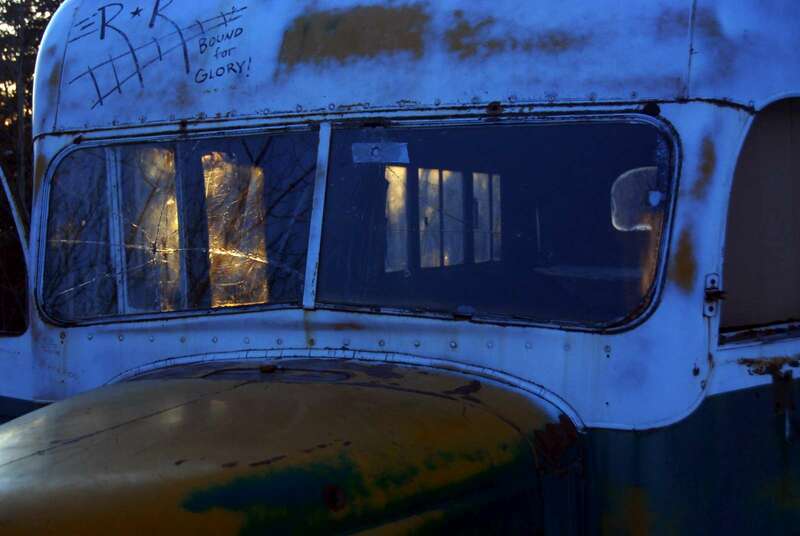 That night it was -20 (below 0) or better at the Magic Bus. Our thermometer bottomed out at -20. You need a lot of gear and a lot of food (the body burns more calories when its trying to keep itself warm) to survive at that temperature. And realistically, this is probably the best time of year and your best chance of making it out to the Magic bus. Why? 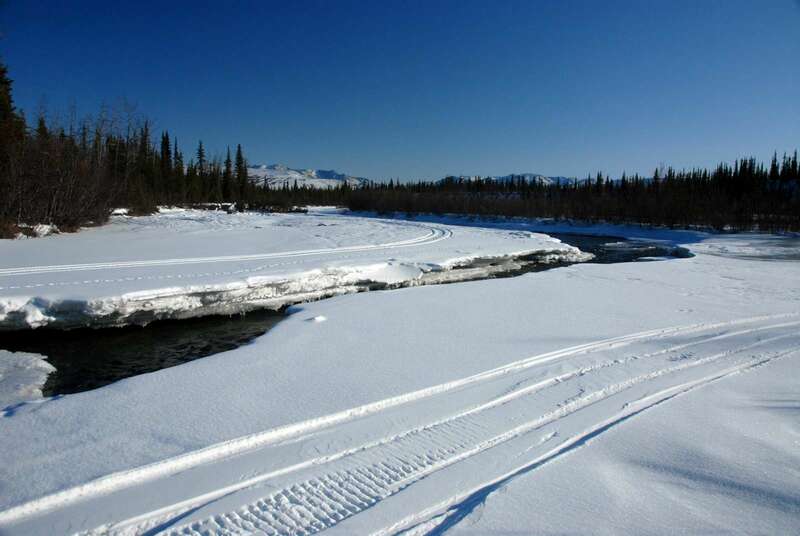 Well, the infamous river that was Chris McCandless’ undoing is still passable thanks to an ice bridge. However, as of March 20th the ice bridge was precarious at best with open water on either side. Also of note, it is borderline impossible to sleep well at -20 unless you are extremely well prepared. If you don’t sleep well your energy is further limited the following day. Is anyone picking up what I’m laying down? Alaska’s back country is unforgiving and if you are not PREPARED it is going to chew you up and spit you out without a second thought. 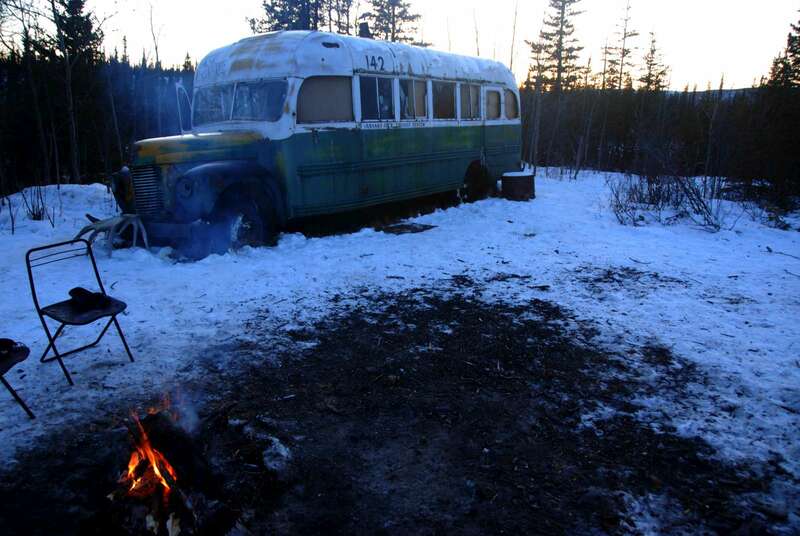 Now that I have given that point due diligence, here’s how you find Into the Wild’s Magic Bus. 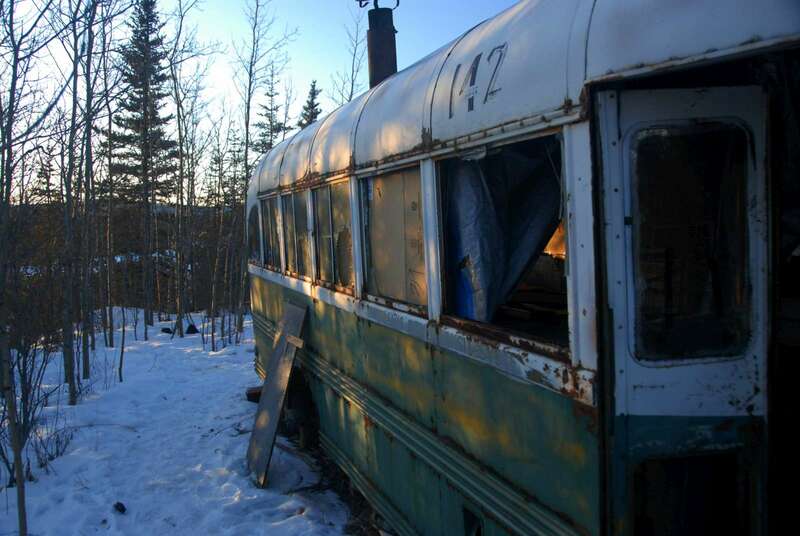 This is your one stop shop for finding your way to Into the Wild’s magic bus complete with GPS points, location and directions. It is actually quite simple. 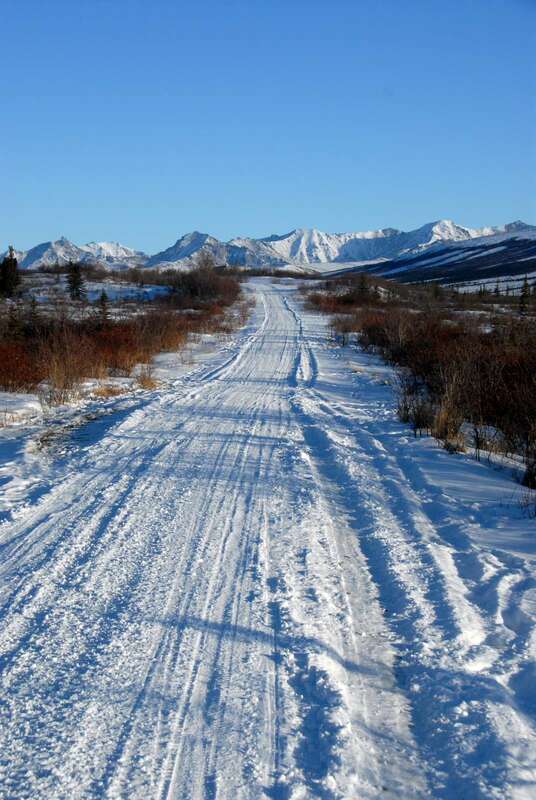 If you take Stampede Road out of Healy it “ends” at 8 mile lake (passable year round [except maybe breakup] by car) and becomes Stampede Trail. See the GPS points below. From 8 mile lake it is roughly 26 miles to the bus. 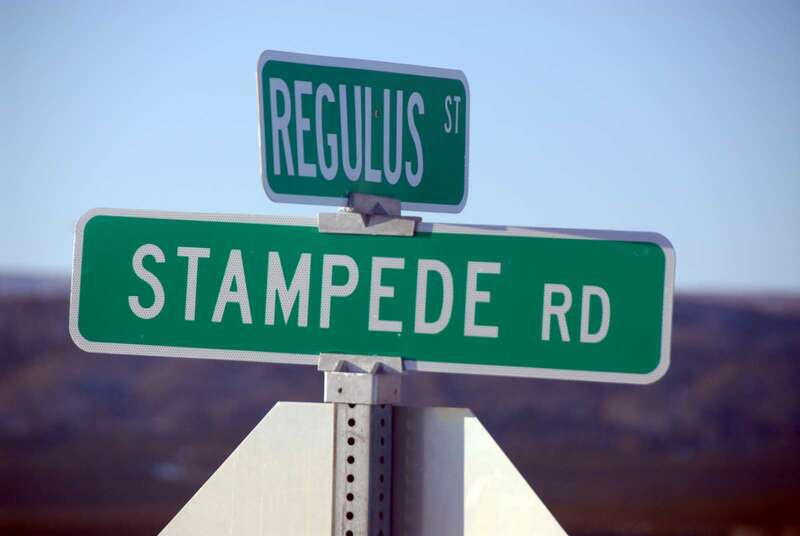 Now be careful, there are a ton of different trails crisscrossing through the back country there, but Stampede is the widest and most noticeable. 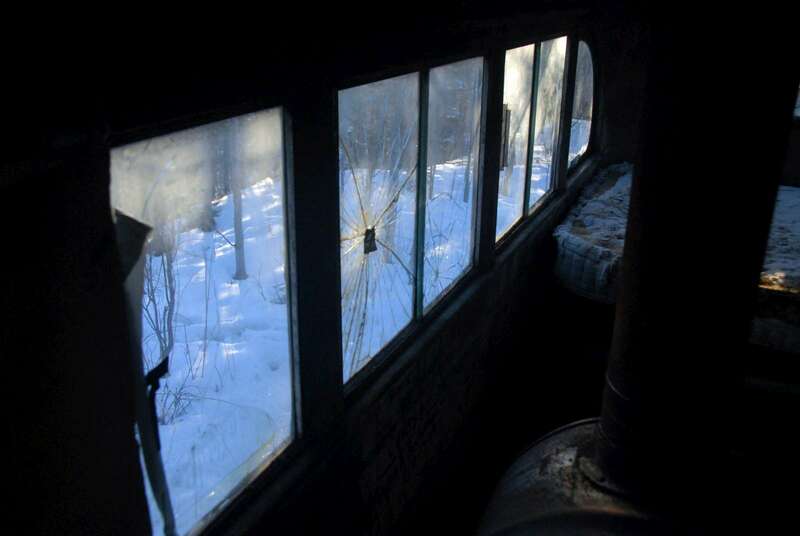 If you simply stick to the main trail from the time you leave 8 mile lake you will ultimately land at the Magic Bus. There is another prominent trail after the river crossing about 10 miles in that spurs off to the left and might confuse you. Don’t worry, it eventually wraps back around to Stampede just before stampede hits the bus. That’s really all there is to it except the fact that it’s a long, long way. 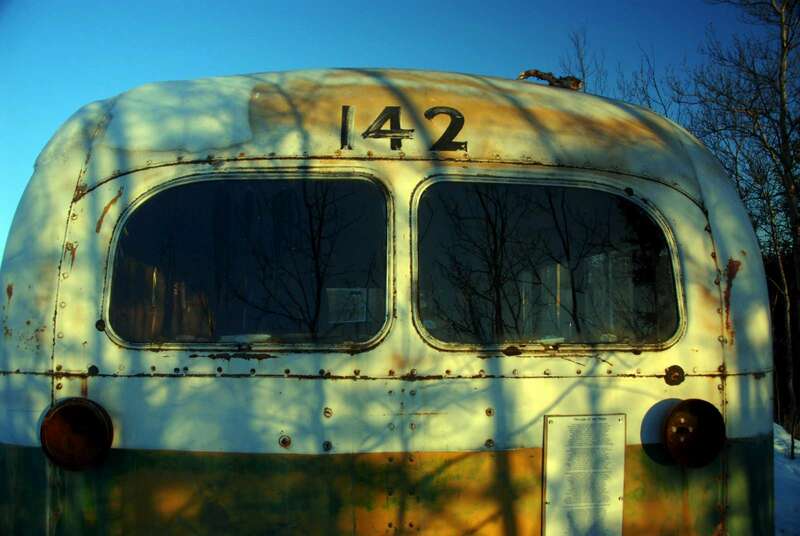 When to visit Into the Wild’s Magic Bus? As I said earlier, late winter and early spring will give you the best shot. Let’s say March 1st to April 10th (McCandless went in on April 26 and had to ford the river) depending on how long that ice bridge hangs out. I would personally shoot for the end of March as you stand a much better chance with the temperatures. Your other option would be late summer or early fall, but you’re once again at the mercy of the river. The conditions of the trail will be much better than breakup. 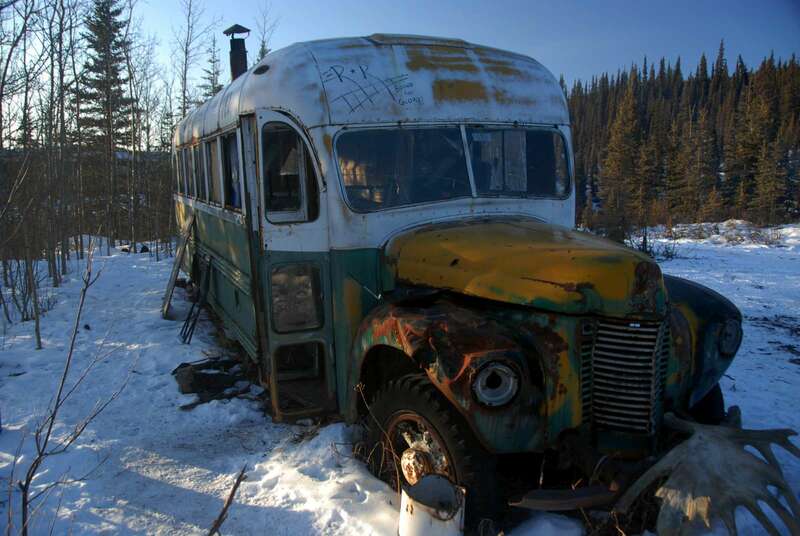 When not to visit Into the Wild’s Magic Bus? Breakup, don’t go out there during breakup it’s going to be a mess. Guess what? In Alaska the snow and ice piles up all winter and doesn’t melt until spring rolls around and that’s called breakup. 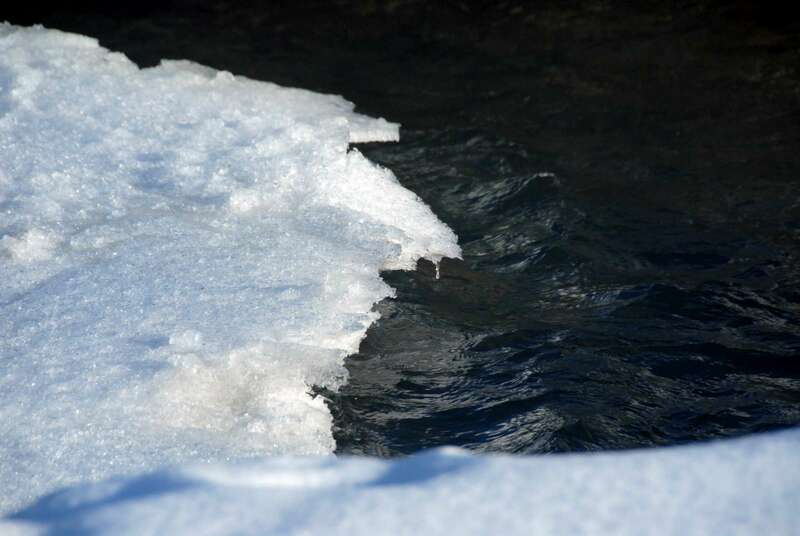 The river is going to be high, fast and very cold from the melting mountain snow. The trail is going to be muddy and no one wants to hike fifty miles in the mud if by some chance you could cross the river. If you do, did you see the boots McCandless was wearing in the movie? 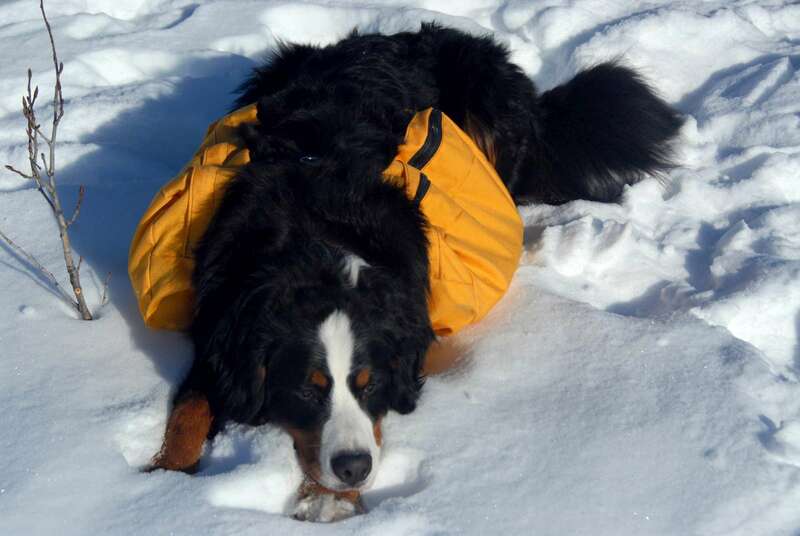 they’re called Xtratuffs (Alaskan sneakers), you’ll need a pair. I would also recommend against early and mid winter. 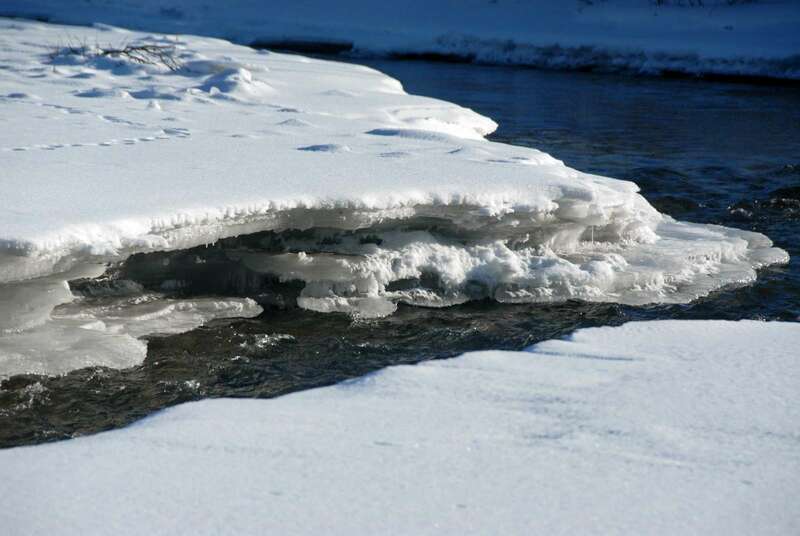 Early winter you will have river problems again as the ice bridge may not be there and mid winter the area has serious temperature extremes. 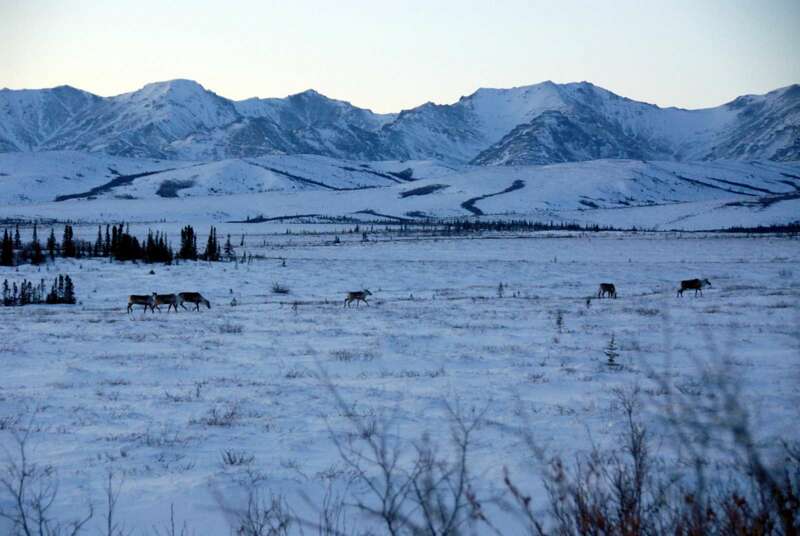 Heed my warning: You need to be trained or highly experienced to survive in Alaska’s back country in mid winter when temps are dropping down to -40 and -50 (below 0). 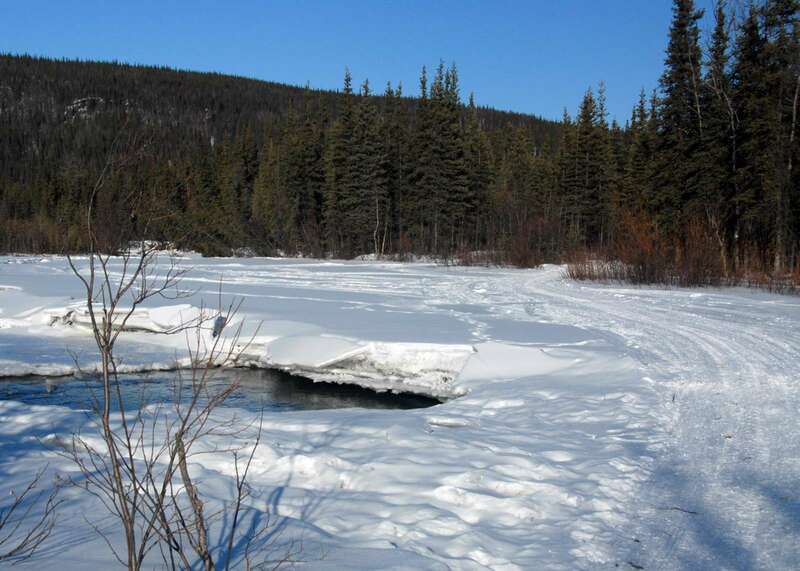 You may also want to check out a new site that provides updated Stampede Trail Conditions. 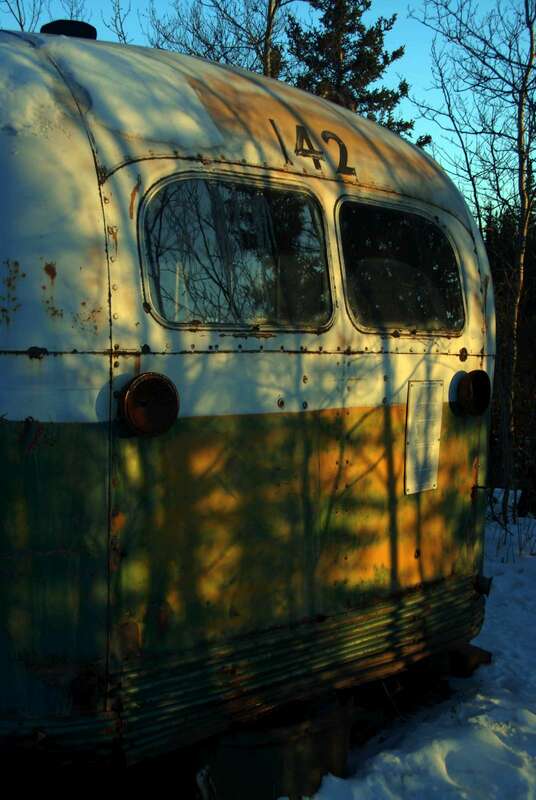 How to visit Into the Wild’s Magic Bus? Thus far I have only discussed walking and I think that if your intention is to pay homage to Chris McCandless than walking is the method you shouldemploy. 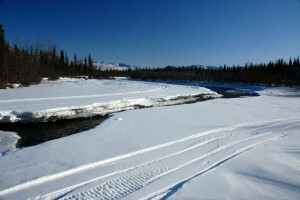 Another option is cross country skiing or skijoring. These might speed up the process a bit though we met a few people on the trail with skis and we were covering ground as fast as they were. 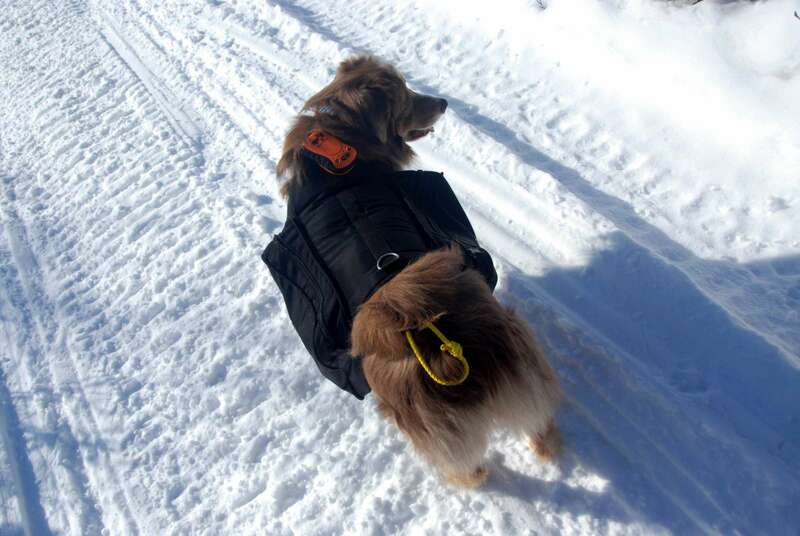 The reason was probably this: I taught my dog how to pull sled this winter and it was him that schlepped all of our gear out to the bus on a sled. (Hint: even if you dog can’t pull a sled it is easier for you to drag 50lbs on a sled than to carry it!) If for some reason you are physically unable to make the hike but have reason to go out there I know of at least two people in Healy who will take you out on snow machine (mobile) at a cost of about $350 per person. 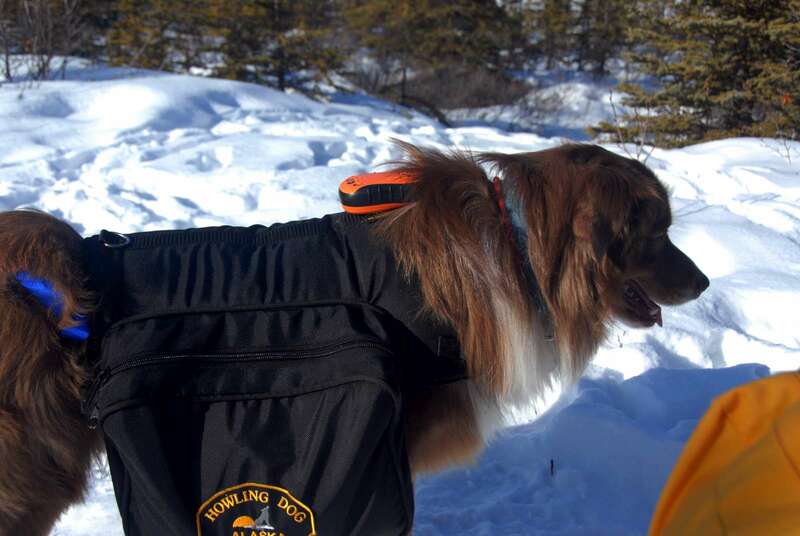 There are also a few places in Healy that offer dog sled tours at around $1000 per person. In addition to transportation you also get a guide that knows the country, which may be favorable depending on the circumstances. I included a “last possible car park” GPS point because stampede trail (not road, but trail) is passable with a good 4X4 (not a Subaru) past 8 mile lake about this far in late winter and very early spring, maybe summer, too. Please do not try and cross the ice bridge in your Jeep. No, speed will not equal success. I was making preparations to leave on what turned out to be a year long trip to Asia the end of 2003 and I received Krakauer’s Into the Wild as a going away present. My folks dropped me off smack in the middle of New York City and I had nothing left to my name but a backpack full of clothes, a one way plane ticket to Kathmandu, Nepal and “Into the Wild” nestled in my curled fingers as I climbed into a taxi cab headed for JFK. 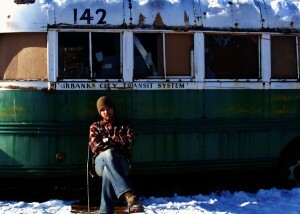 I knew nothing of Chris McCandless and the parallels of personality that ran common between us. It’s not an easy gig giving up everything you own for a dream, an idea that is unclear at best. All you really know, deep down in your belly, is that if you’re going to do anything truly great in this life you have to be willing to put everything that the world tells you that you have on the line for what it is that you know you have inside of you to be realized. I was early for my flight, for once in my life. I remember propping my feet up on my backpack in the terminal of JFK and starting Into the Wild. The story gave me comfort to a certain degree to know that there were others out there who felt the call to push the limits of existence. 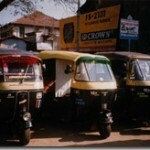 It became not only difficult, but tiring trying to explain to people why I was headed to Asia with a one way ticket. The invariable look of consternation becomes overwhelming after a while and you start to wonder if you really are insane. But you push on, as Chris pushed on, into realizing the parts of yourself that are invaluable. You feel the isolation that comes from driving at an idea that others do not understand. And finally, you come to terms with the consequences and realities of your undertaking. 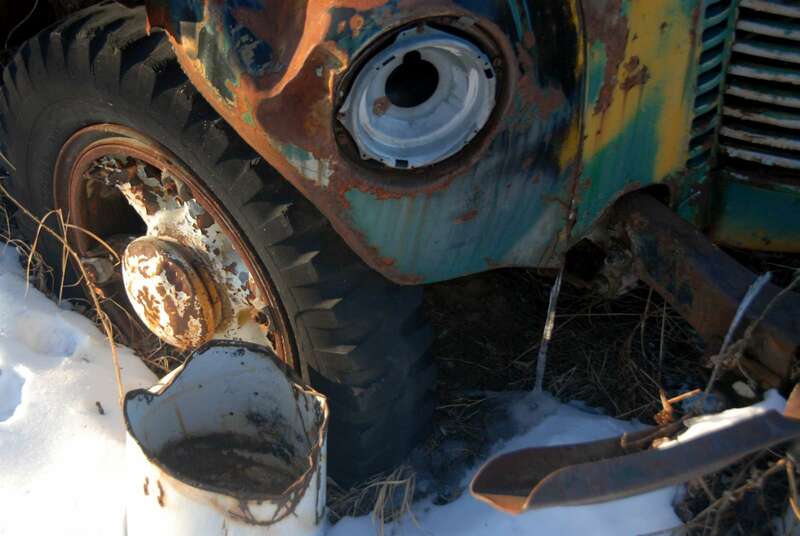 Christopher McCandless paid the ultimate price for his dream, but not without consideration. In his last letter to Wayne he said “If this adventure proves fatal.” And that’s it right there. The willingness to die for something, for your own dream, that is what made Chris great. To be passionate enough about your dream to pursue it at all costs is what sets great people apart from the rest of the people. 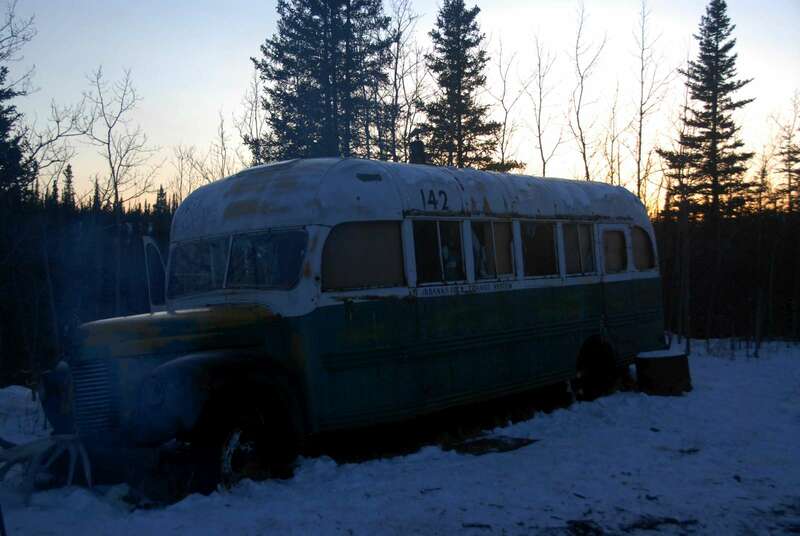 Why did I go to Into the Wild’s Magic bus? I wanted to say thanks to someone who helped me feel not quite so alone when everyone thought I was crazy. Moreover, I wanted to pay homage to someone who was willing to die for their dream. I respect that. Congrats, by far the coolest thing you’ve done so far in Alaska! I’ve been planning my own journey to the bus for a while now and had a couple questions that I haven’t been able to find solid answers to. Judging by your blog you seem to be more educated in this area than anyone else I have talked to. 1. whats the bear situation like in this area? 2. it originally looked like I would be in Alaska in may. Would I be absolutely brain dead to try and get across the river in may? Thanks for having a look at my blog. 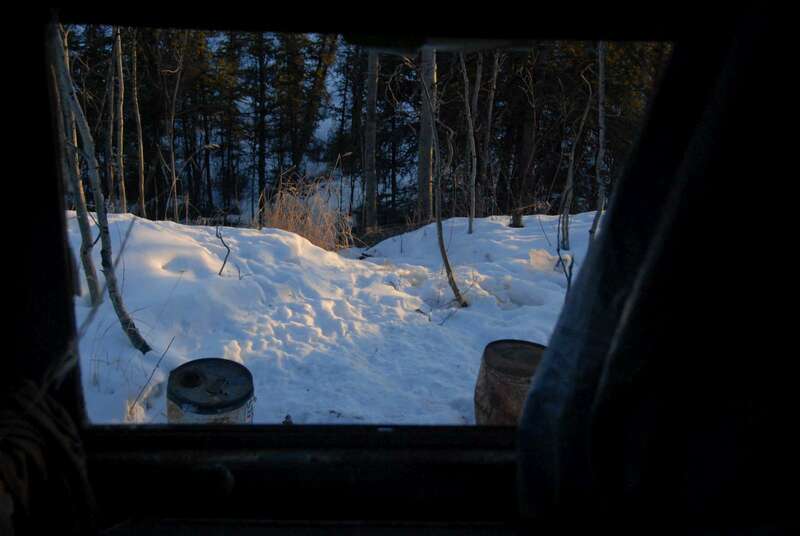 As far as bears go, that’s certainly a concern and even heading out there about the first day of Spring we were packing bear spray. 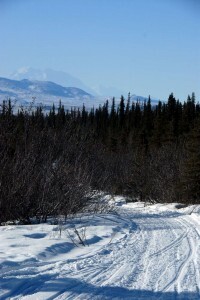 You should be able to pick that up at most outdoor stores in the Fairbanks or Anchorage area. To be honest though, its effectiveness is questionable. It certainly doesn’t have the stopping power of a 45, but it’s better than nothing. The truth be told, moose are about as serious a concern as bear. 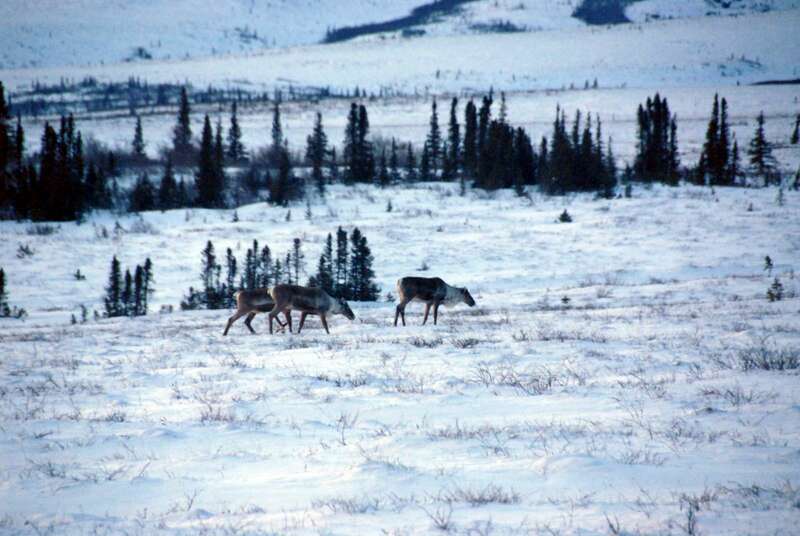 Large, hungry animals start to stir up here come spring time and there’s just nothing you can do about that but be as prepared as possible. Passing the trail in May. 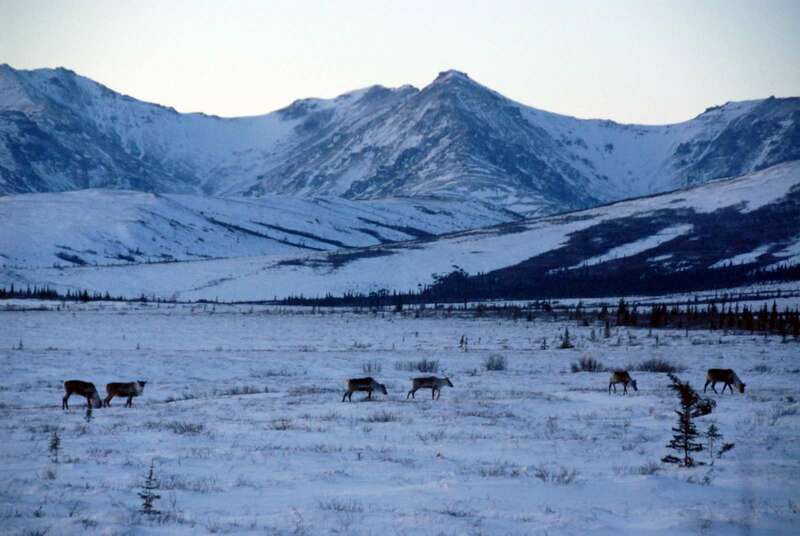 Well, by all accounts it has been an unseasonably warm winter in interior Alaska. I would suspect that things are going to start getting soggy about that time. If you don’t mind hiking in the mud than I say have at it. A pair of Xtratuffs (like McCandless had) will certainly be in order. Remember, Chris McCandless made it out in April. Also, I hear there is a foot bridge about a mile off of Stampede trail if the river going gets rough. I haven’t seen it myself, but there’s a fellow who follows my blog named Charles who might know a bit more about it… Charles do you know if that bridge is upstream on downstream from Stampede trail? By coincidence ( if it is ) encountered “Into the Wild” on the 25th of march about a week ago. Today I’m reading about your adventure that you just finished. Amazing! I’m reading the book now and its impressive, what a story! I’m 48 years now and I’m at a turning point in life again. I’ve been working now for 21 years in a casino in the Netherlands where i do live. In 1985 and 1986 i did spend a year very minimalistic in Brazil. 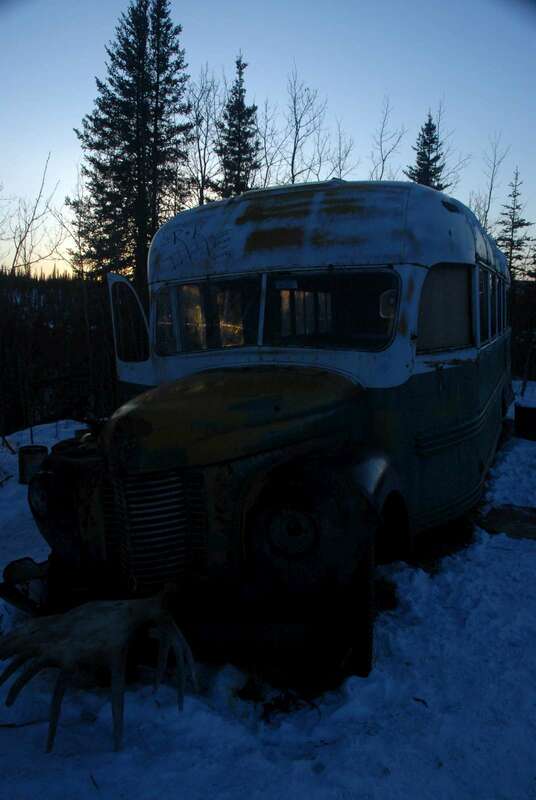 This story caught me and one day i’ll go to Alaska and will visit the bus as well. An inspiring man, Chris McCandless. Thanks Brandon for your beautiful pictures and impression of the place to be. I’m so glad you found my story. Inspiration is everything. I also believe that their are no limits, you can do absolutely anything that you set mind to. That’s why I put so much effort into creating this site and making it as accessible as possible. When people like yourself stop by from across the globe and share their story or a part of their life it really makes my day. You made my day Fokko. Thank you. Hello Brandon, and everyone else who is following this blog. “I too have the same dream of leaving this horrible society we people have created for ourselves. We rely too much on our cell phones, TV’s, fast food restaurants, and money. In this world, within this society, you literally cannot survive without money, it sickens me how materialistic we are becoming. I have been on several trips myself, kayaking, and hiking through particualr canadian territories. I do know what it is like to live free from society, and i cannot remember a time where i was happier. I did have a few luxuries when i went, but i think it dumb to go out in the wild as chris did, although i understand and respect the reasons why he did it. I think he just took his hatred for materials a little too far, considering it attributed to his death. 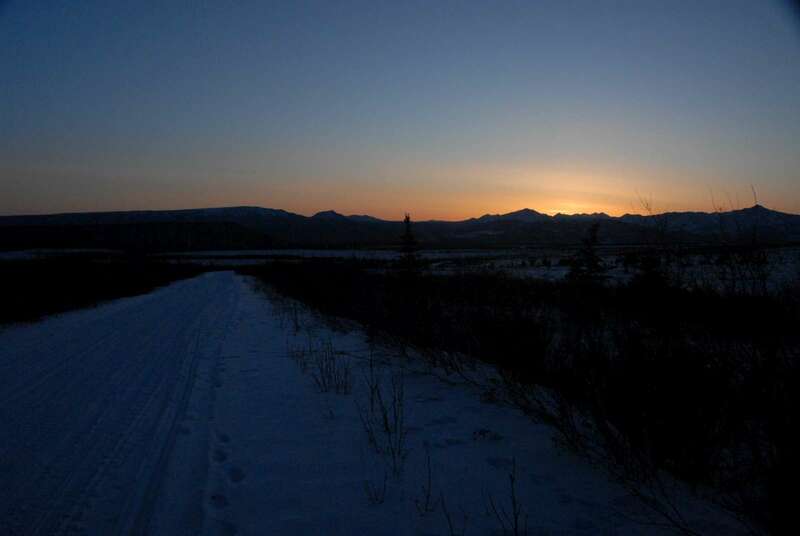 Just remember long traveler(the person to whom i wrote this) that the nights can get very lonely out in the wild, you must plan days ahead of time what you are going to eat, or you might end up having nothing. Winters are cold and very unforgiving, the life of a wonderer is not easy. I am 22 years old, and plan to go north into Canada, maybe the Yukon territory, I don’t really know, i want to see where life will take me. I am inspired by Chris’s story and by what he did, but i think it smart to be prepared for anything, i don’t need a fancy GPS, or any technological tool to survive, but i don’t want to make it harder on myself than living in the wild will already be. Trust me, the life is not easy. the days are long, and the nights are longer, but there is nothing more Beautiful than looking up at the night sky, no where near civilization, and being able to see every star in the sky, no humm of cars buzzing by, no glow of the city lights, just the sounds of the trees blowing in the wind. I wish you luck on your travels, maybe we will be able to share stories in the future. to all those who seek the adventure inspired by Christopher Mccandless, I wish you luck, and hope all goes well for you in your journey. Love reading your adventures. Miss you. I guess that you will not be at the reunion this year. It will be at Dad and Aunt Carol’s in Alum Bank on the weekend of July 31. I know that it can not begin to hold the same fascination compared to what you currently are doing, but we all would love to see you . Maybe next year. Kisses to you. 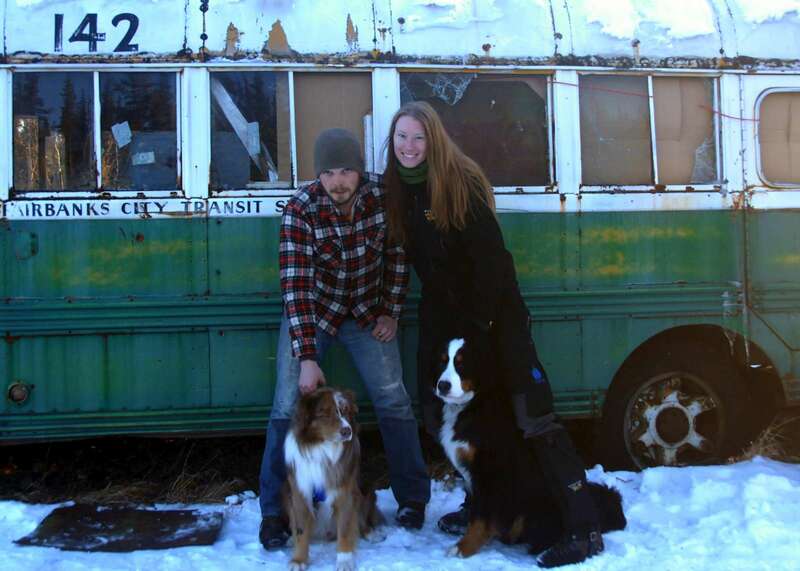 Thank you for sharing this great article… it is impossible not to feel touched by the story behind Chris McCandless/Alexander Supertramp’s inspiration, and tragic ordeal that defined his end. Anyway, great job with the entry, very perceptive and respectful. I guess you have a new subscriber! Welcome aboard Luis and Nick. I’m glad that you fellas enjoyed the article. If you guys are thinking about making the trip and there is anything I can do to lend a hand let me know. Otherwise, enjoy the blog – I’m glad you found it. 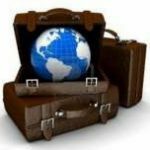 Great post and insight into your experience. Those that are inspired by someone and actually go trudge the same trails are inspirations themselves. Brandon… thank you for sharing your wonderful and truly inspiring stories. What a journey you did!! That experience will define you and stay with you for the remainder of your life. 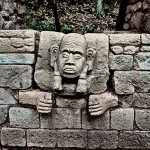 I am researching this trip for a friend of mine. 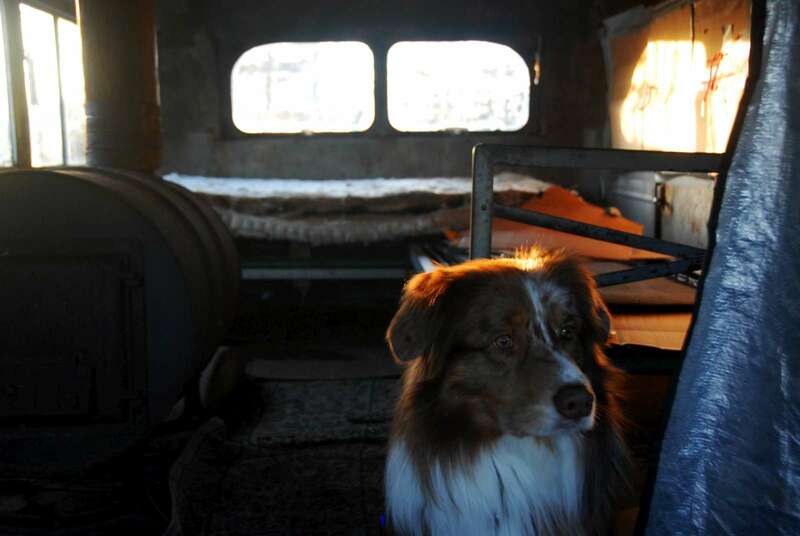 He has interest in visiting the bus and the famous trail. I have printed your advice, directions and story for him to read. I just wanted to say thank you for taking the time to share your journey with us. I’m going on a 7000 mile road trip to Alaska this July, unrelated to McCandless’s bus. However I’ve been facsinated with his story for years now. Is there any way to cross the river at another point, even at many miles either way? Who can I contact? 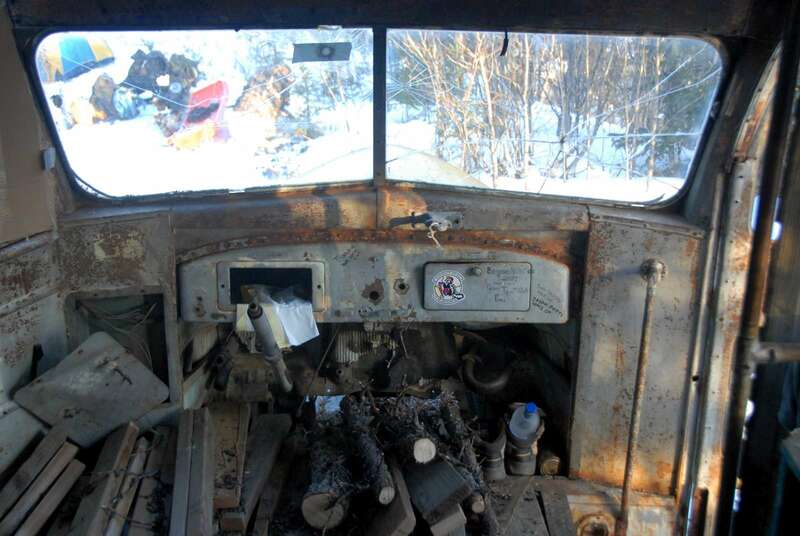 I’ve looked online many times before, but everything is so outdated…I’m thrillled to have found your blog and to know now that the bus is in fact still there. Any help would be greatly appreciated. 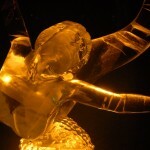 Great website and writings. I just watched the movie and that led me here. I don’t agree with the whole concept of a sickening, money-driven society. Sure, money is the safest way to survive, but it is just another step in financial evolution from bartering, which I should think was human beings’ first economic interaction. And what is wrong with trading my skills or goods for yours? Life without bartering (or money nowadays) would be very dull indeed. With regards to escaping this drudgery, a 142-style journey is excellent but should be temporary. Little excursions, is it a lonely walk through Alaska, a hippie stroke in Brazil or something more trivial like a change of job or favourite sport should be welcomed; but never appropriate anything new permanently. I am a high school student, probably with a higher maturity level than most. I have fallen in love with a story and a past that I feel the need to get a lot closer to. I am currently saving money and planning my trip to the magic bus, all though…I have virtually no idea when this dream will ever come true. But I do know that it WILL come true. I would love to contact you and ask a whole lot more questions to help speed up my trip. anyone know how the bus got there in the first place?? The bus got there via industry. 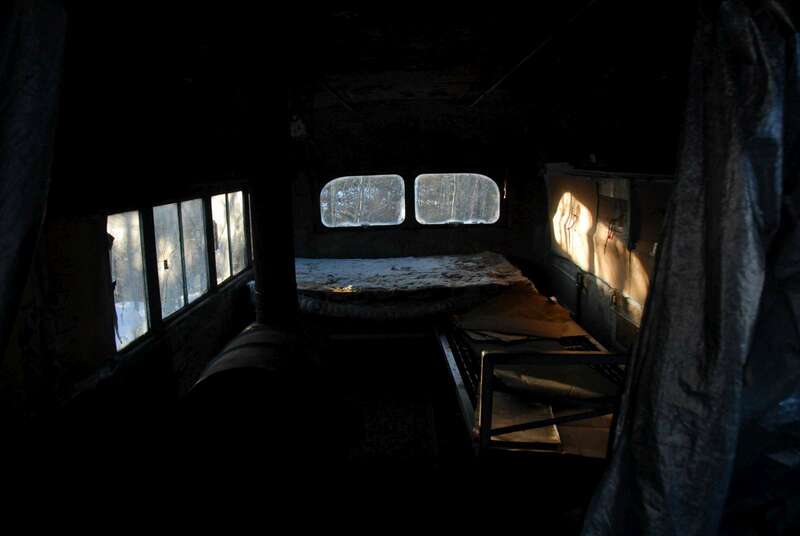 At some point crews (do not know if it was logging, oil, gas , etc) skidded several buses in as temporary shelters. 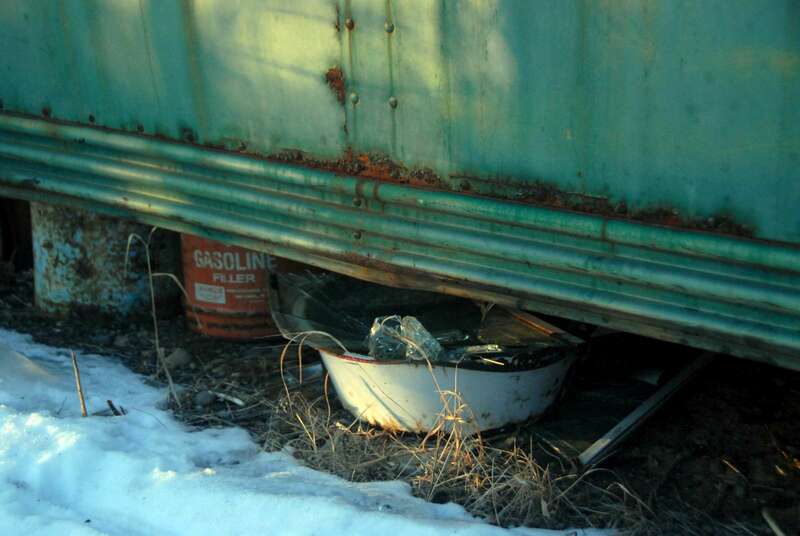 After the industrial need for them was over several were left and became make shift shelter for hunters and such. I read this in an article somewhere, although unfortunately I cannot recall who wrote it or in what publication. I am not so surprised that so many people are checking into the Bus that was in the movie. I myself was at the Bus, but it was many years before Chris was there. Feeling the rapture of nature myself and a big fan of the “Hemmingway’s adventures of a young man mentality” I went to Alaska in seach of the “White Noise” reality of standing out in the arms of Mother Nature so she could hold me there. I found out about the Bus by asking in stores and bars about local sites of interest and the bus was mentioned in a bar. I arranged to meet the owner of the (land) bus and paid him so I could stay there at a later date. The movie about Chris was chilling as I recalled my own trip to the bus and the desolate, thrilling commune with nature. I also saw “Call Of The Wild” about Chris. Chris’s story brings to mind Alexander The Great’s world travels and how Chris’s story is scaled down in magnitude from that. Alexander The Great vs. Alexander Sewper Tramp. You can tell Chris was a great reader because he treasured his books as he traveled and buried them under his bridge home so he could retrieve them later instead of getting more copies. 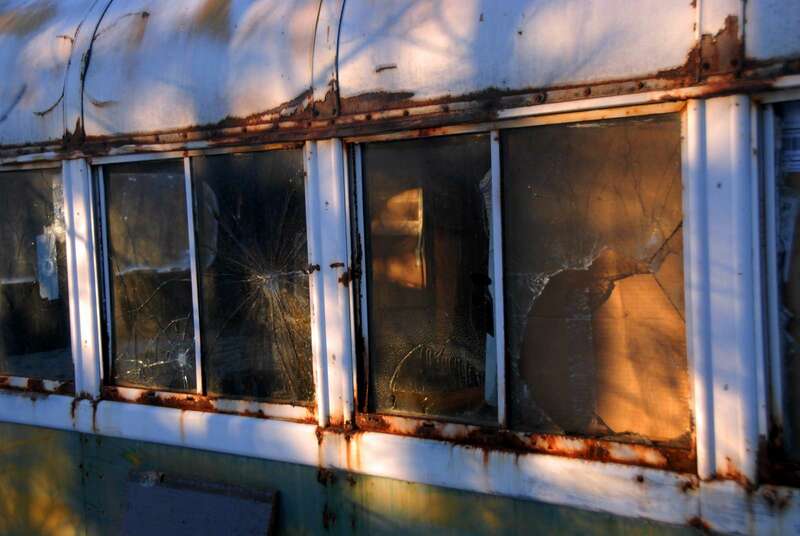 I too have best wishes for the preservation of the bus and it’s contents now that it has superceded a mere point of travel interest into a icon/relic/shrine from the movie industry and daily life, much like Zabriskie Point. By the way….. What is the point of Zabriskie point? Any way…. to any one who reads this….. please take care if you travel out in the wilderness, be prepared and be respectful. 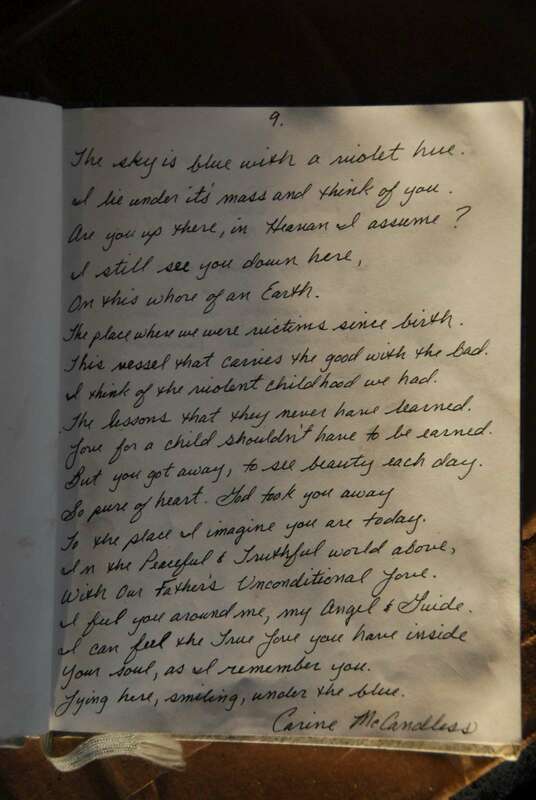 Also a kind thought goes out to the McCandless Family on their tragic loss. I remember the sequence of news blurbs as they searched for Chris and the final note when they found him at the Bus and stark realization I had been there. Chris had found out about the hitch hikers/tramping circuit too and now I am thinking the “Bus” will become a part of that “Tramping Lore”. Good luck to all in your travels! I first read Into Wild awhile back and became very curious in his story. I’ve done a full length project on Jon Krakauer’s book. My sisters fiancé also shares the same interest as me. I have lived in Minnesota my whole life and have always wanted to visit Alaska. 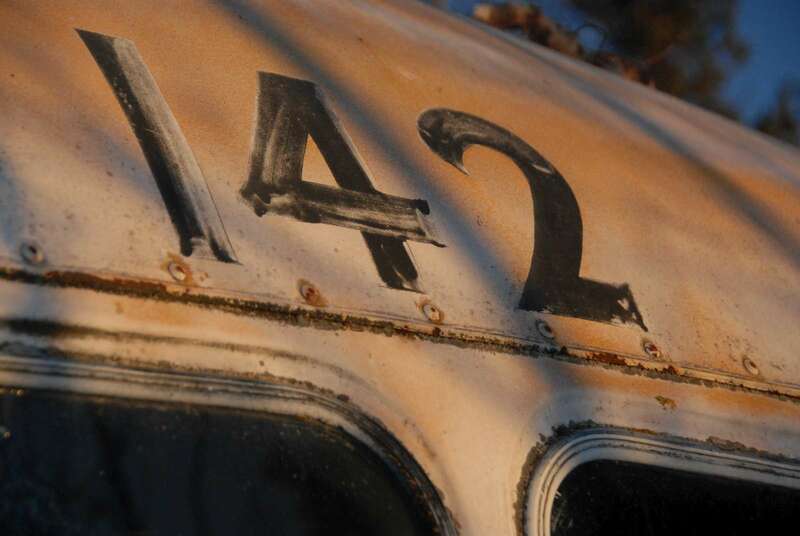 And after falling in love with the story, I am interested in visiting Bus 142. 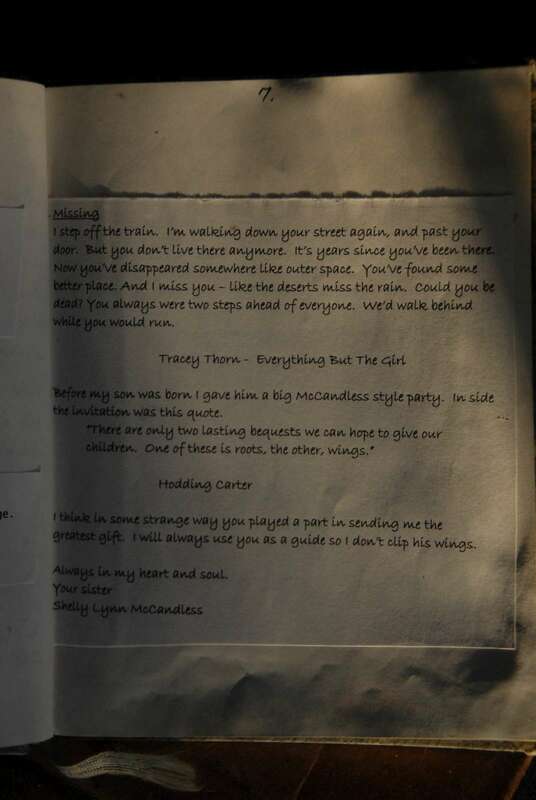 So here is my story. My sisters Fiancé is stationed in Fairbanks and my sister lives there with him. My family is planning to visit in early august. Me and him have talked about visiting the bus but we don’t know if it’s possible to visit in Midsummer. Also we don’t have much time. I have a ton more questions for you if you are willing to help us out. And no, we are not just two inexperienced people. We have a good feel for the outdoors. But most of all we both have a great passion to live our dream of seeing the bus. I hope to hear from you soon. Thanks!! Hi Brandon, thanks a lot for all the information you gathered for all of us. As Chris you are an inspiration for all of us, dreamers of a better world. Look, we are two friends travelling from Argentina, we started our trip more than one year ago with the objective/dream/inspiration of reaching the magic bus. 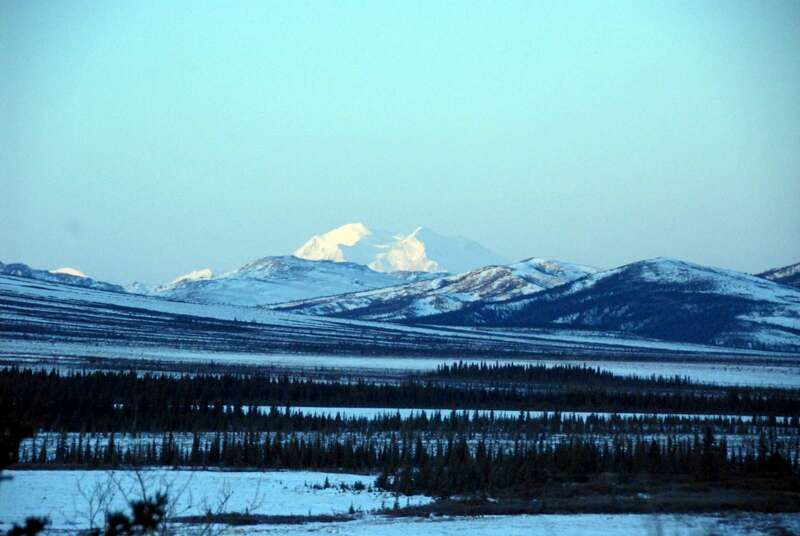 We are in Seattle right now, and we have already booked our flights to Fairbanks for first of August. We don´t have the chance of waiting for any other date to try and reach the bus….so, do you think we could give it try anyhow??? Is there any way we can contact you more directly for more detailed information??? We are musicians, we travel playing our music but we dig a lot for the outdoors life as well. First of all ..congrats!! this blog is amasing. 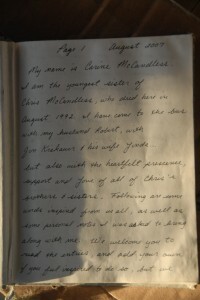 I’m from Chile and I’ve been facsinated with McCandless story for years now. Finally I’m in Anchorage and I really want to go to the bus. Is there any way to cross the river now? maybe at another point, even at many miles either way? If you can help me with some information I’ll be so glad! And hello everyone. I’m sorry I’ve been so slow to answer your wonderful comments. I’ve been out to sea on a fishing boat here in Alaska for the last four months. Marlis, I’d say you may have pretty good luck right now getting out there. There is no snow left to melt for the most part and it hasn’t really rained in two weeks or so. I’d bet that river is pretty low right about now. Again, this is how McCandless met his fate so be aware of changing weather conditions as a solid downpour could alter the conditions of the river in a heartbeat. As always, brew a few days extra food and remember that fall is coming and it’s going to be colder out there than in town. Good luck. With all the interest this Alaskan site is receiving I hope the new found popularity doesn’t destroy it. 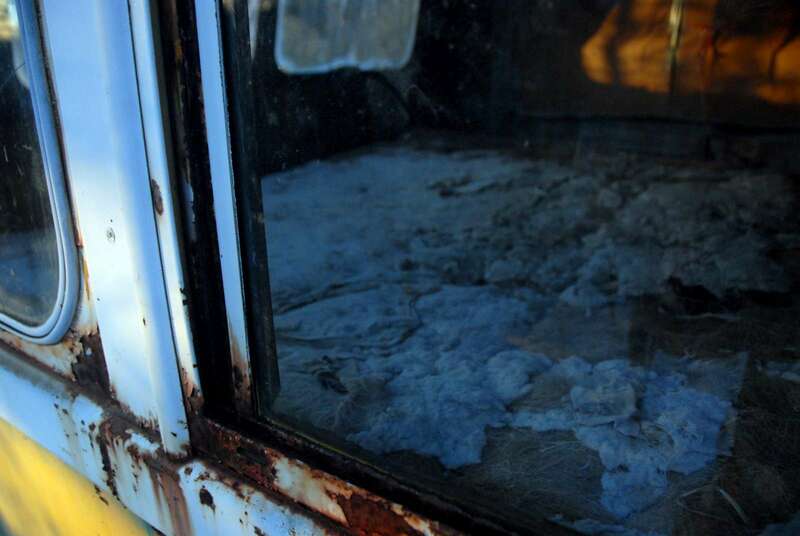 It would be a real shame to see trash left around, graffiti carved/marking the bus, souvenirs taken. Most people are respectful but 1/100 that arrive leave the scene worse than when they arrived. I thank you so much for your time and effort in cherishing and preserving Chris’ memory… I read the book “Into the Wild” a little over 2 years ago. Ever since reading that book, I too felt a connection to what Chris accomplished and conquered in his life. For the past two years I have created my own dream of one day being able to journey out there to the Magic Bus. Even if it were for only moments out there, it would be a fulfilling gift that so few people can relate to or ever experience. I lay aside all trepidation and will continue to reach for that inner calling that Chris grabbed…Thanks again so much for your webpage here and your words. Your information provided here has proven extremely beneficial to me, as well as show your influential knowledge with “Into the Wild”…. As much as I would like to, I could and probably would never make this journey. Thank you for sharing! I too, was deeply moved by Chris’s journey “Into the wild” I will never see the magic bus personnally, but I wish all of you brave travellers every success on your journey. 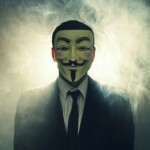 This is possibly the best commented blog I have found. And wonder if anyone knows or read other articles that may mention any of Chris’s acquaintances. Would be interesting to hear their stories if the media/film people ever managed to track any of them down. And what his parents and sister’s story since. just feeling exactly the samt. left germany half a year ago to go to california. watched into the wild with mr best friend before i left. you just said everything that can possibly be said about that topic. Hola, me llamo Ernesto soy discapacitado y siento algo dentro de mi que me impulsa a llegar allí de una manera u otra. Mi cabeza solo piensa en Alaska y en la increíble historia de nuestro amigo Supertram. I watched the film, in ignorance of its history etc, recorded from TV, on 17 february 2011. I found it a very moving story albeit knowing that “dramatisations” are never the same as “reality”. In the UK/Scotland, whilst we have “wild places” we do not really have anything comparable to the wildness of N.America and it would be hard to truly “disappear” in our country. I do have one question: How did the magic bus get there in the first place? sorry – email address was incomplete. So for my 18th Birthday me and my best friend want to head out to pay some respects to Chris, who is a hero of mine, We decided we were not gonna walk because my friend is not the most avid hiker haha, we decided we are going to take a couple atvs out there like we have seen on some youtube videos of the trips out there, the only problem my birthday is in the middle of june so i think by then it will be to late to go the because of no bridge or anything, but up in your blog you mention going out late summer, when is “late summer”? 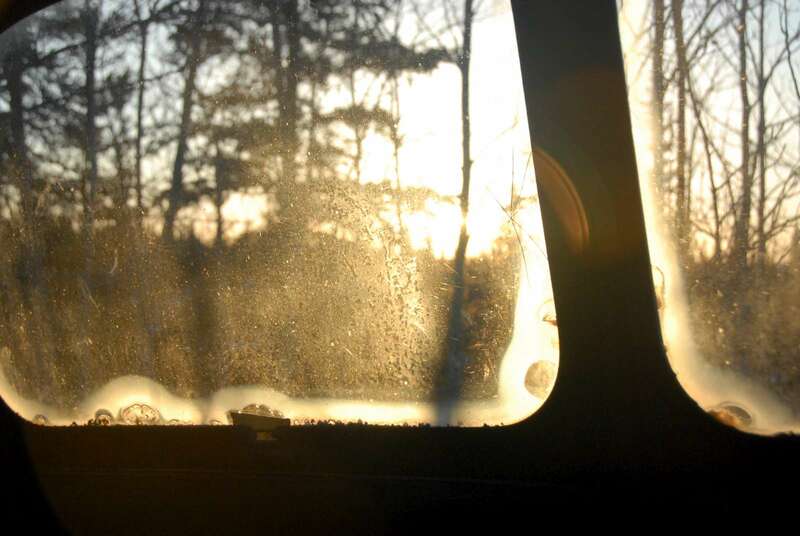 Thank you and I’m very glad i came across your post, ever since i read the book “Into the Wild” I have always wanted to take a trip up to the bus. Ok, the industry brought the bus there, but does anyone know how technically took the bus to a place 50 miles away from the last parking lot? See u there bro! Respect the bus! I’m keeping it short, so I’m running the risk to be misinterpreted, but that is also a part of the disadvantage of a format like a weblog. 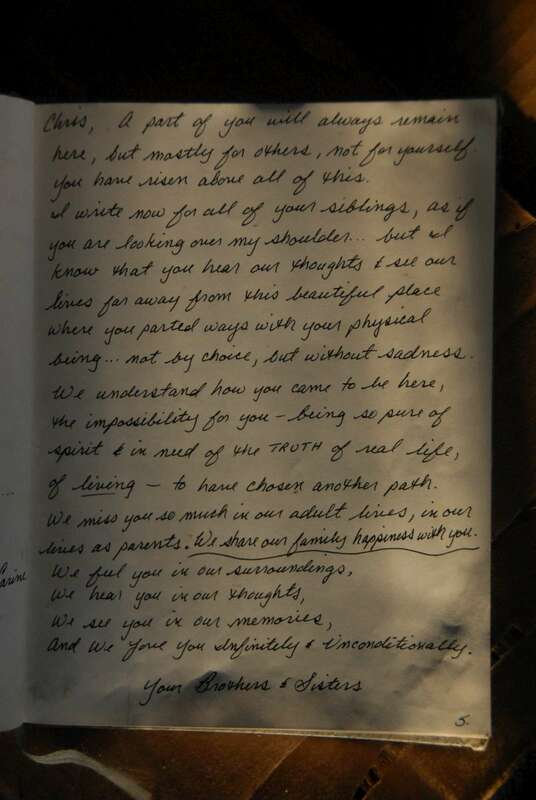 What I want to say is that, on the one hand, I get where ‘you’re going’, I think I understand what the idea is that your pursuing, I value that you are able to unchain yourself, just like Christopher was. On the other hand, however, I’m having a hard time with the following sentence: “To be passionate enough about your dream to pursue it at all costs is what sets great people apart from the rest of the people.” Great people? The rest? Don’t you think that’s an overly simplified interpretation of ‘humanity’? And so, for you, the American dream is what everybody should pursue? Haven’t you ever wondered if what you believe and perceive is not ‘the truth’? Considered that there are other ways of coping with the world, fighting against what you think is injustice? That perhaps not everybody’s situation or character and somatic contingencies are welcomed and controllable, possibly shaken off? That people are stuck and just can’t get out while they desperately want to, and that it’s not something like a ‘weak will’ or a ‘lack of character’ that keeps it that way, but something one might call fate, or chance? That it is (just) the way it is, without us really being able turn it around radically? Just a couple of suggestions; no disrespect intended. I hope you’ll appreciate my asking these questions, my demand for reflection. Also, I’m not claiming to have found a ‘better’ interpretation, or such thing as the truth. Greetings, welcome and thank you for your comment. You are the first person who has raised any sort of controversy over this post and I thank you for that. You said: “for you, the American dream is what everybody should pursue?” This is not what I meant at all. Certainly the dream of McCandless was not in line with what is commonly accepted as the American dream. I’m not going to get into what exactly the American dream is, but it seems a concept littered with consumption and materialism. Perhaps that is a function of the way we (the majority of Americans) define prosperity. To me prosperity is a richness of experience and not a richness of goods. It is closeness with one’s own sense of the divine. It is a willingness to try and leave the world a little better than you found it. I think Chris would agree with at least some of that. His dream was to live with the wilderness standing apart from the majority that has been allowed to define the American Dream. And that’s what I was after in that statement, the dream of the individual. I have gotten a lot of flack in life for the exact concept that you have pointed out and I won’t deny that. However, I am a still a firm believer that you make your own destiny, that you and you alone are responsible your “fate.” I don’t believe in no-win situations and I don’t believe in circumstances that are insurmountable. I believe there are people who are willing to put everything that they have on the line for their dreams and there are those who are not. That being said, I accept that I could indeed be wrong about the world and I’m not contending to have the truth. I’m not professing to be right. I’m just one man out of billions trying to make sense of this world and I refuse to believe that you shouldn’t fight for what it is that inspires you. Nothing worth doing is easy to do. Frederic, thank you for stopping by my site and contributing to the conversation, you are welcome here any time. 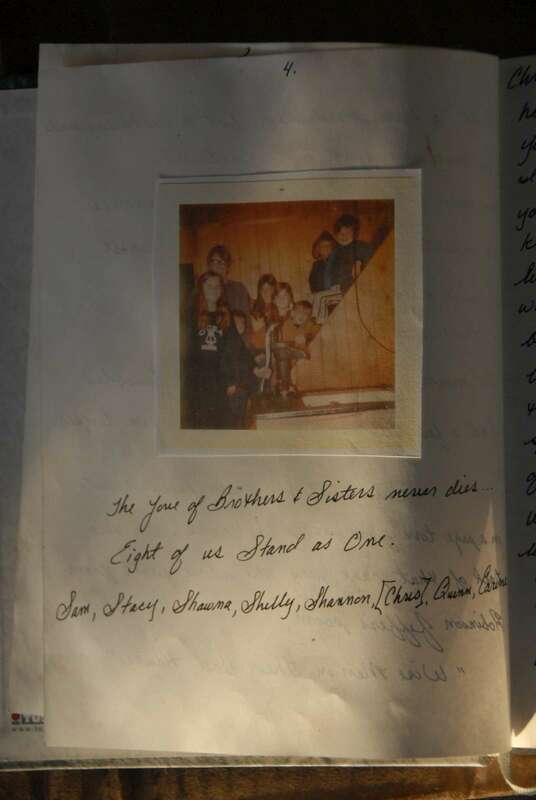 I found your blog while researching for an article I’m about to write about Chris McCandless and a new book about him that it’s coming out at the end of April. I read Into The Wild while on a journey to New Zealand, during a difficult moment of my life, and it made me feel less alone, it kept me company as no other book has ever done. So I totally understand you when you say that you wanted to pay homage to Chris, what I’m curious about is this (and I hope you don’t mind me asking): you took a photo of yourself out of the 142 bus and I’m sure you’re aware that that’s the same photo Chris took of himself and that many other take when they go to pay homage to him. Why did you take that photo in that same position? Was it something impulsive or you gave that a thought? 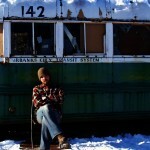 I’m trying to understand why Chris’s life and adventure has inspired so many of us even though it ended tragically and I got stuck thinking about this point: about how all of those photos outside the 142 bus resemble his photo. Is it an attempt to empathize with him? Also, great post. I loved reading it and it helped me understand why Into the Wild has been such an important book for me. Thanks for stopping by. I’m glad that you enjoyed my article and I’ll try to answer some of your questions. I think this story really drives home some very important points of existence. From my experience with others who have also made trek out to the bus it’s a story that seemed to hit them at a particularly vulnerable time, like myself and also as you stated here. It’s pretty far reaching, too. It has the ability to inspire people who would never even consider doing something like McCandless did. It gets them out of their box for a moment. Those of us who have had similar experiences are pretty few and far between and we usually don’t have much community in them. We’re the crazy outsiders. 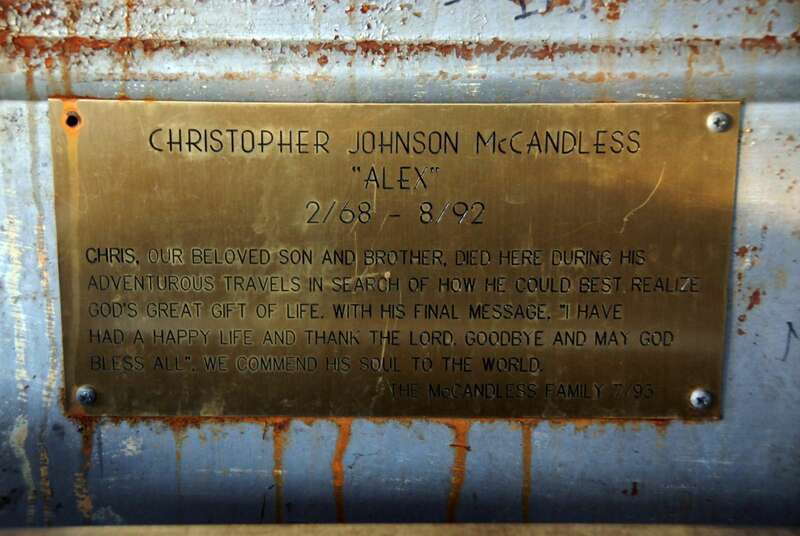 This story and the life of McCandless give us that sense of community. As for the photo, I certainly don’t mind you asking. That’s what this blog is about. If one person learns one thing from one other person than all the work here has been worthwhile. I think that subconsciously I might have been trying to empathize with Chris in taking a photo in the same spot, but it’s probably much simpler than that. You know how when you sit down in a restaurant you, by nature, pick the chair where your back is to the wall and you’re facing the door? I think the choice to take the photo in the same spot is more intrinsic like the chair in the restaurant. It would be pretty impossible to get a good photo from the other side. There’s a steep bank there. If you have even the slightest sense of photography you’ll be drawn to the text on the side of the bus to really drive home the shot. I think it’s almost the law of nature that leads everyone to that same spot for a photo. I wish I had some grand philosophy to share with you, but it’s simply the most agreeable angle. I think if the story didn’t exist and you sent 100 people into the wilderness and told them to find that bus and take a photograph of themselves by it at least 70% would come out with that shot. Of course, you do still feel as though you’re sitting there with a good friend you never knew. I’m also curious about the “something changes once you actually see the bus” part. 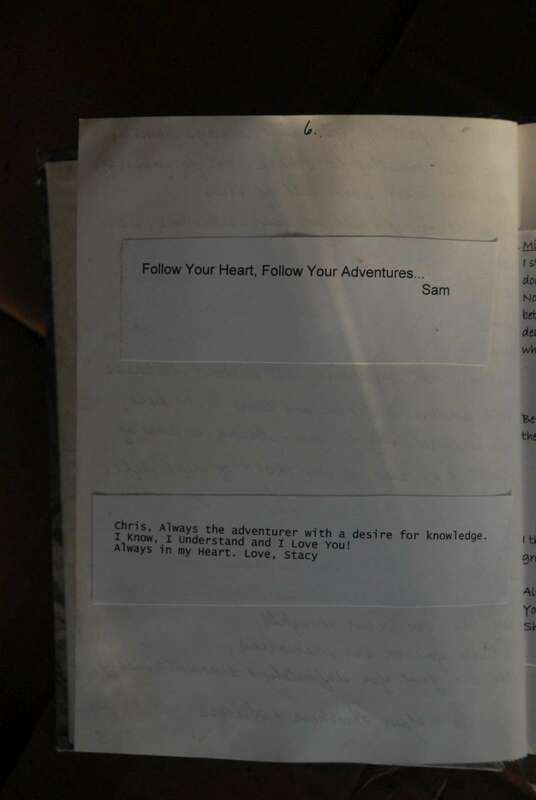 When I was travelling around NZ feeling lost and clueless about my future, I felt Chris as a companion, as a travel mate, extremely close to me even though I didn’t know him. But you say that seeing the bus makes you feel even closer, how is that? what’s the feeling like? That’s a tough question. 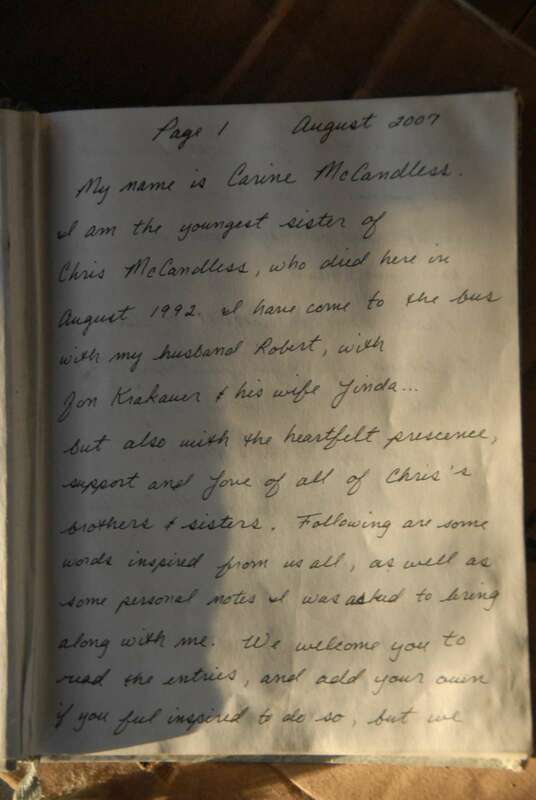 I had the same feeling of Chris as a companion while I was wandering around India, Pakistan and other parts of Asia. We bantered on constantly. I’ll have to chose my words carefully. I think the timing is key to point out as it relates to my personal story. It was six years from the time I read the book until the time I actually visited the bus. It’s been a year last month since writing the post you read and I’ve had a lot of time to reflect on the experience. When you arrive at the bus everything does change. I don’t know if it’s a closeness with McCandless that you attain as much as a peacefulness. His struggle and how it related to my own is something that had been burning inside of me for years. At some level that burning ebbs. The inspiration is still intact, but suddenly there aren’t any questions left unanswered. You’ve come to the end of the story. There’s not another chapter. It allows the idea to be complete. Once you’ve spent six years pondering it’s a weight off of your shoulders. You stop trying to understand and you accept the reality of the situation. In all of that you gain a familiarity with McCandless that allows your stories to intellectually coexist inside of you own head. In my last reply “Then, you’re just saying… Hey” It’s like an old friend now, one that you can spend an entire day with, have a blast of a time and there’s no requirement that you say anything at all besides maybe hey. Like that old friend you love them beyond measure but you know their story in it’s completeness. It’s a peaceful, easy feeling. I was thinking about these 2 things. I’ve been following the developments with the new book. 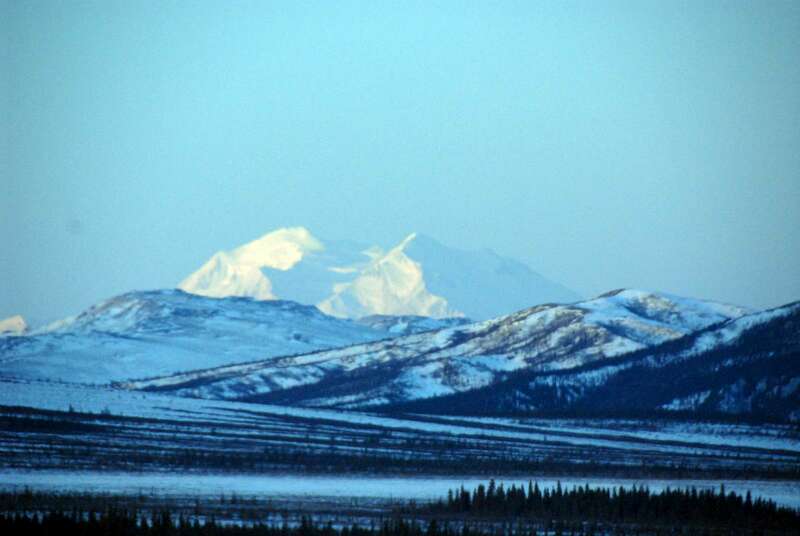 I follow Heather Horton on Twitter and get most of my news from Erik Halfacre, an acquaintance who runs christophermccandless.info and pathfinderalaska. Very nice guy, too. Passionate. 1. Chris’s experience got under my skin not because of the Alaska adventure itself, but because of the fact that he was able to choose a path for his life even though that path was far from his family/community expectations. Do you think it’s the same think for all of Chris’s “fans” or you think they actually worship the crazy thing he did by facing the Alaska wilderness so unprepared? I don’t think it has anything to do with Alaska. It’s the idea of pitting yourself against something greater than you. Alaska is just a great forum for that. I got home six months ago from a year and a day in Alaska. I’ll personally attest to its ability to make a man out of you. I hope that nobody worships the act itself. The idea should outlive the act. I think his fans are divided into two camps. There’s the camp with the cajones to actually go out there and do these kind of things and then there is the vicarious camp. 2. 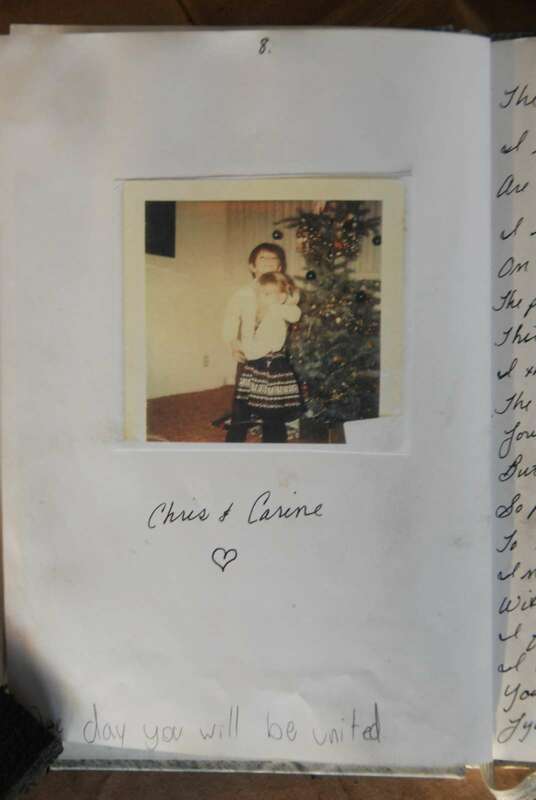 This new book is going to include photos and letters and journal entries written my Chris himself. No more Jon Krakauer, Eddie Vedder or Sean Penn. Just his voice. Earlier today I was thinking that maybe this new book will allow people to have a new perspective on Chris as a person rather than as a myth. Cause I don’t see him as a hero for what he did (he died in the most horrible and stupid way, if you ask me), I see him as somebody not prepared to face an environment he didn’t know and this lead him to his death. And please notice that I say this without being judgmental. But when I read about some guys that almost died trying to reach the magic bus and about a swiss woman drowned on the stampede trail I felt that the whole Chris-McCandless-Myth was out of control. I get your point of view and the homage “pilgrimage” but those people in order to pay homage risked their lives, and I don’t find any courage in this. Don’t you agree? As far as the guys getting into trouble on Stampede trail, there’s no accounting for intelligence. 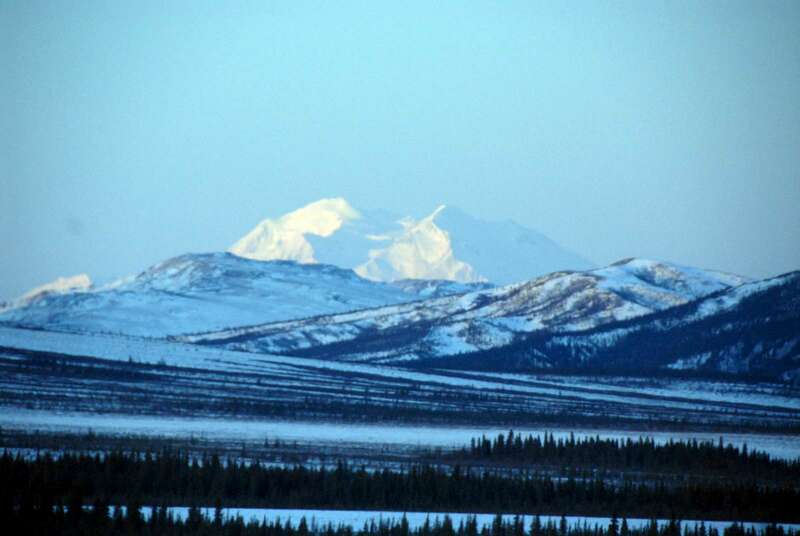 Most people underestimate Alaska. Things get out of control fast. Some people just don’t have the wits, experience or intellect to make good decisions in the wilderness. You get a lot of kids that are up there just to see that bus and I think some of them do have that hero mentality. It doesn’t matter how much reading you did on the Internet. If you just got off a plane from California yesterday you’re not prepared for a 50 mile wilderness hike in Alaska. There are exceptions, of course. I’ll point out that I made the hike with a Spot GPS – a device that allows you to contact emergency services from anywhere in the world and give them your GPS coordinates. Is there courage in it? It seems to depend on how you’re looking at the situation. If you are well prepared it takes courage to go out there. If you’re not prepared and you know what happened to McCandless than you’re just not too bright. Personally, I’m a bit of a Darwinist. This good planet is stretched pretty thin on resources as it is and I’m not losing sleep over it naturally weeding the morons. This is a truly inspiring view of how Chris McCandless looked at life but also a very real warning of the reality of our mortality. You should also look outside the box to consider others affected by Chris’s actions and wonder why he didn’t do some things better. Brandon’s’ sterling collective goes a long way to satisfy our further curiosities about Chris, his story and his journey, regardless of origin of interest, but I think many are overlooking the obvious that Chris didn’t survive his journey. To be inspired by his beliefs, you really need to carry out your own journey , in your own way and on your own route, with better contingencies. By trekking to join the hypothetical queue of mourners who are visiting the bus ‘shrine’ you are following the lemming trail. You’ll do more justice to the memory of Chris by writing your own story into history by surviving to tell about it rather than a ghoulish trek to the place where his ended prematurely. I was also inspired to visit Alaska, but by the excellent 2nd book of the late Pete McCarthy, “road to McCarthy”, by the humour it brought. Sometimes it is better to approach a journey looking for humour and happiness rather than mourning the life of another. Good luck to everyone, thanks to Brendon and our thoughts to Chris’s parents and family, wishing the story had turned out differently. I agree with Colin. 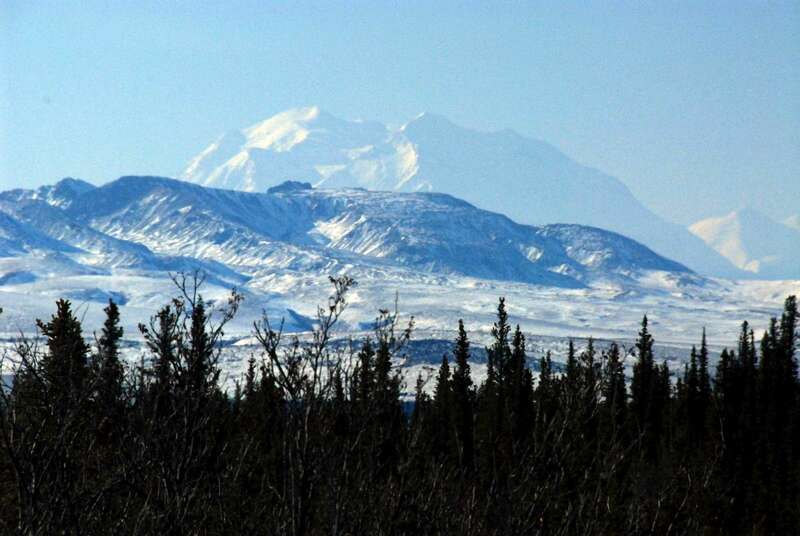 Dozens of people trekking up to Alaska to find the place where Chris died is hardly in keeping with the ethos by which he was trying to live. You might as well turn it into a theme park. It reminds me of the way Jim Morrison’s grave in Paris has become a shrine for every hippy in the northern hemisphere. Whatever meaning it ever had has been lost under the graffiti. I saw the movie last night, not having heard of the story before, and found it very moving and looking further into the story brought me here. I’d love to go to Alaska, but I don’t want to be Chris McCandless. Learn from his story and find your own road, as he did. 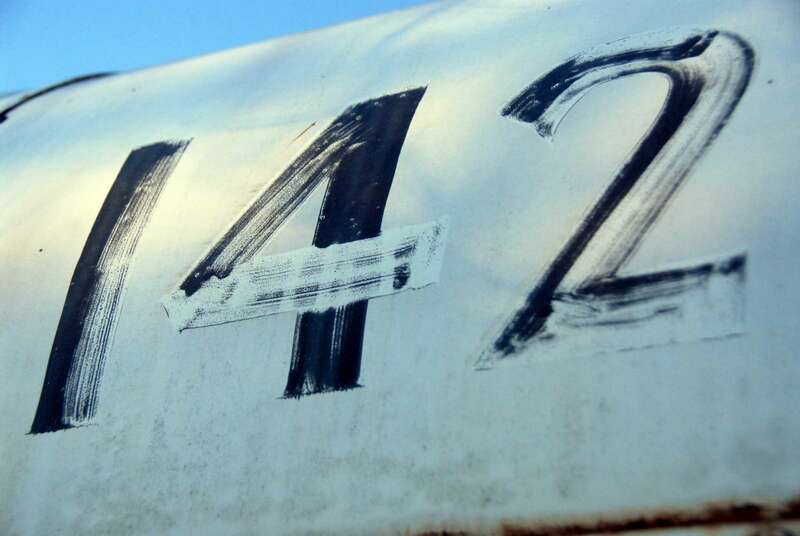 Do you have a link or any information on atv tours to bus 142? Thanks. hi Brandon: I really love the movie and story ,could u send me a photo of the magic bus with large size? many thanks! Hi there, Cool submit. Likely to issue together with your web page with world-wide-web adventurer, would certainly examination the following? Firefox ‘s still the market industry leader plus a huge portion of other people will probably pass up your own terrific creating because of this trouble. I have an easy and maybe a stupid question: Where and how can I learn how to be able to face this kind of adventure? And how much time did you prepare to know how to do this trip? I’m young, maybe too young, but the story of Alexander Supertramp totally changed my way to see myself and things around me. Is the first REAL dream that I’ve ever had by far, a true one, and if it’s still growning there is a reason. I’d really appreciate your help and your advises. I don’t want to be the one to send anyone on a wild quest they are not ready for. You know if you’re ready. We didn’t plan this one for much more than a week, but we both had extensive experience in the outdoors. We were in good physical shape and also had an emergency transponder. 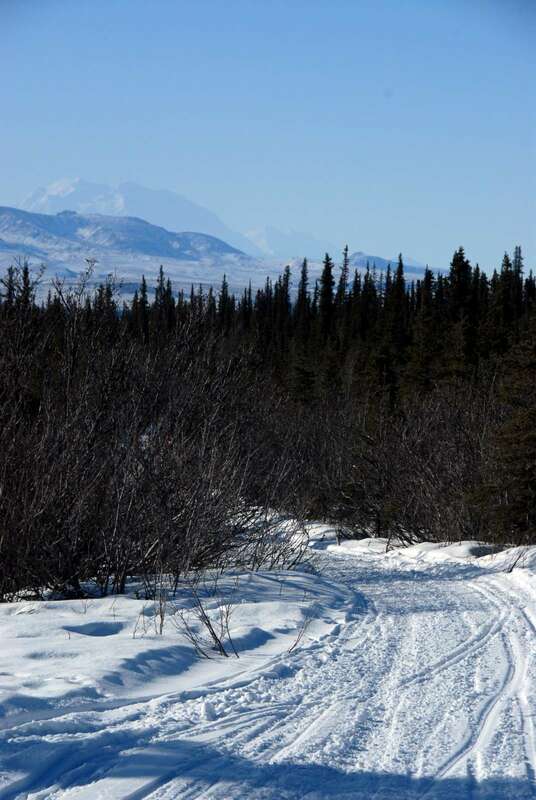 You really need to have the right gear and the right experience before embarking that far into the wilderness, especially in a place like Alaska. Take your time, build up to it, gain the knowledge you need to deal with conditions out there. When you’re ready, you’ll know. 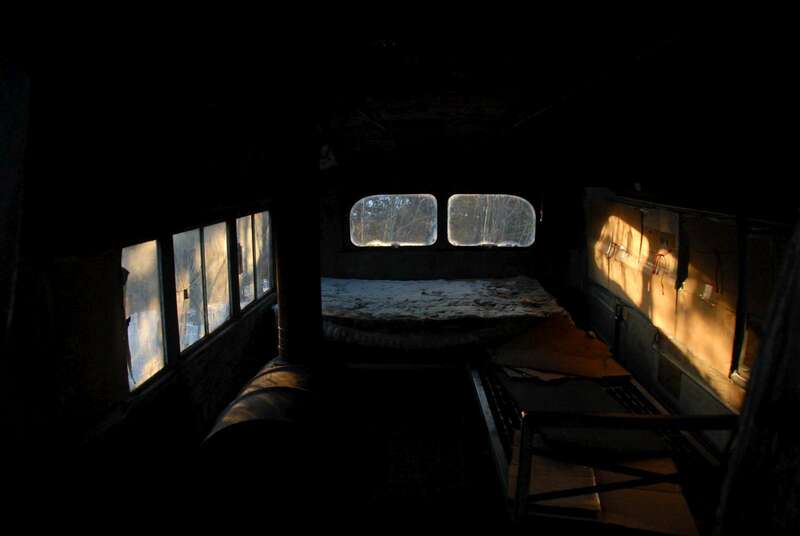 I like the Idea of visiting the bus and living off the land for a few months. Very inspiring and so cool. I consider myself what many people would call an ” ultimate enthusiast of nature” and i’m so prepared to go deep into the wilderness. Would you advise me to bring a caliber.50 to hunt some bears? That seems like overkill to me. Hello, first thank all of the shared information. My name is Juanma and in September I would like to travel to Alaska from Spain and visit the Magic School Bus , I was caught by Alex Supertramp messages . I have a couple of questions . ¿ September is good date or maybe the days are too short ? And of course , bears … you met a bear ? … What is there in danger you can run? You cannot run faster than a bear. September is not a bad month if the river is low. You really need to be prepared out there and have the proper outdoor experience and training. I don’t remember what I was doing at the time or what chain of links led me here, but I can say that I truly appreciate finding this blog and what it has just done to help me snap out of it. I don’t know where I go from here, I am more or less trapped in my current existence and I am not sure how I will break out of it. I know I have to escape, I just don’t know how or if I am in too deep to climb out. But I do know the blinders are at long last off. Perhaps someday these wings will once again fly. Maybe even to places like this, where I can attain a sense of peace that many of us search for but few of us ever find. Sometimes I wonder why I’ve went to the expense and trouble of keeping this site up and running all of these years. You, my friend, are the reason. Every so often someone like you stops by and hears what I have to say, leaves a heartfelt comment about what it all means to them, and takes some small action in their own lives. That means more to me than anyone could ever know. It justifies every single one of the 1000’s of hours I’ve put into creating and keeping this site alive. Thanks for coming by Ron. And thanks for not just cruising along silently. You’ve made my day. So I am Latvian guy who has a dream about this bus over 5 years, since now i had prepared myself by traveling around Europe by hitch hiking every summer last years… I have feeling that i need to reach this place to give Chris my honor and i can’t even explain i just have to do it. I have only few following questions (at first i just wanted to do this trip without any tips but for sure we all have to take care about ourselves ). My question is ,do you think its possible cross the river late in July, for example on 20th dates? And yes i am prepared for hiking and living in cold environment because weather are pretty similar in my country :) i even do preparing hikes around forests in Latvia and temperature now is -2 to 7 degrees by Celsius. As i know in summer time it is quite warm. And you probably know does the smart phones works there, or better i need to get any satellite phone if (i hope not) i get in trouble ? There a many people that hike out there and cross the river during the summer time. Just keep abreast of local weather conditions. A significant rainfall could make things more difficult. Good luck to you! Firstly, thank you Bartender … for sharing the journey you made and your perspective on… everything. Particularly in the exchange with Rachel. Throughout, your writing has the rare effect of conjuring up real people for me; you, Chris, Alaskans various. Why am I here? Last night, looking for something to watch with just the two of us at home for a change, I sat with my son (just turned 11) and we made it through half of ‘Into the Wild’. Why half? So many questions right off the bat… so few answers… we ended up contemplating life, the universe and everything and turned it off to finish another time. Since we are flying/road/ferry/train tripping (camping, fishing, hiking) Alaska (and BC, AB, MT, WA, OR) this summer, I thought I’d put the bus and Chris’ path on the mental map so we can talk about life etc again when we are closer .. so I looked for the bus, and found your blog. What do I think about what you’ve said? It’s heartening to know there are so many people (like you; like the people who’ve written to you here) who challenge, change and/or reject the ‘ideal’ paths/roles/boxes/ways that our societies attempt to shepherd and shove us along and into. People who journey… who choose different and diverse lives (and lives within lives). But I agree with your thoughts on the stupidity of lack of preparation (Chris’ and others) and hope that people heed your warnings. Regardless of how much a person wants to be an island, they are not… not being prepared and capable of looking after yourself is selfish in the extreme – and affects (sometimes endangers) others. It’s sad that we seem to have to go so far from where we started to find/test/grow ourselves – a developed world problem? (I loved your Aunt’s comment btw :-) I gave her a virtual hug… I hope you’ve made it to reunions since). Your comment on community (or lack of) grabbed my attention. For that reason alone, thank you again for continuing to invest in this endeavour as you do; your connecting us all (even fleetingly and indirectly) is no doubt part of the antidote we seek.